Sarajevo has been nominated for featuring on the main page as Destination of the Month. We may have failed to notice some minor glitches in the article. Please plunge forward and help improve it further before it hits the main page. The Latin Bridge in Sarajevo is directly across the street from where Archduke Franz Ferdinand was killed by Gavrilo Princip, setting in motion the beginning of the first World War. A historical marker is located at the bridge entrance on the left side of this picture. Another marker is on the building adjacent to the spot where the assassination took place, across the street. Sarajevo, is the capital of Bosnia and Herzegovina, and its largest city, with 430,000 citizens. Most of the city is within the Federation of Bosnia and Herzegovina, but some parts are in the Republika Srpska. Sarajevo is very tourist friendly, especially in the Old Town in the center of the city. Sarajevo is one of the most historically interesting and varied cities in Europe. It is a place where the Western and Eastern Roman Empire split; where the people of the Roman Catholic west, Eastern Orthodox east and the Ottoman south, met, lived and warred. It is both an example of historical turbulence and the clash of civilizations, as well as a beacon of hope for peace through multicultural tolerance. The city is traditionally famous for its religious diversity, with Muslims, Orthodox Christians, Catholics, and Jews coexisting here for centuries. Additionally, the city's vast historic diversity is strongly reflected in its architecture. Parts of the city have a very Western-European look, while other parts of the city, often blocks away, have a completely distinct Ottoman feel. It is truly the city where east meets west. Some important events in Sarajevo's history include the 1914 assassination of Austrian Archduke Franz Ferdinand, which led to World War I, and the 1984 Winter Olympics. The city has physically recovered from most of the damage caused by the Yugoslav Wars of 1992-1995. Sarajevo is a cosmopolitan European capital with a unique Eastern twist that is a delight to explore. The people are very friendly, be they Bosniaks, Croats, Serbs or anyone else. There is little crime, with the city ranking as one of the safest in Southeastern Europe. The city of Sarajevo stretches west-east along the river Miljacka; the main arterial road and tram routes tend to follow the west-east orientation. It is set in a narrow valley, surrounded by mountains on three sides. Most tourists spend a lot of time in Old Town (Stari Grad). The eastern half of Old Town consists of the Ottoman-influenced Bascarsija (BAHS CHAR she ya; etymologically baš (head, main), čaršija (bazaar, trading area) in Turkish), while the western half showcases an architecture and culture that arrived with Austria-Hungary, symbolically representing the city as a meeting place between East and West. Sarajevo has a humid continental climate, since mountains surrounding the city greatly reduce the maritime influence of the Adriatic Sea. Summers are typically hot (record high of 41°C in 2008) with an average of 46 days per year above 32°C, while winters are snowy and cold with an average 4 days per year below -15°C. Rain can be expected in every season, with an average of 75 days of precipitation per year, which in winter often falls as snow. If you are staying at a a private residence instead of a hotel, you should register with the local police within 24 hours of arrival. Failure to register may result in a fine or possible removal, but most likely won't bother anyone. 43.8253818.336431 Sarajevo Airport (Medjunarodni Aerodrom Sarajevo, Butmir Airport, SJJ IATA), Kurta Schorka 36, Sarajevo 71210 (6.1 km southwest of the railway station, in the suburb of Butmir), ☎ +387 33 28 91 00. The following airlines operate service to and from Sarajevo Airport: Adria Airways (Ljubljana), Air Serbia (Belgrade), Austrian Airlines (Vienna), Croatia Airlines (Zagreb), Eurowings (Cologne/Bonn, Stuttgart, Berlin), Lufthansa (Munich airport), Norwegian, Stockholm Arlanda seasonal), Pegasus (Istanbul-Sabiha Gocken, only certain days of the week), Qatar Airways (Doha) and Turkish Airlines (Istanbul-Atatürk). At the main hall of the airport (after the customs, Central Hall) there are for instance currency exchange (at the center floor booth), lost & found (after the customs to the right) and a bookshop (after the customs to the left, at the NW end of the central hall, located near the entrance doors), where also SIM cards (BH Telecom) are sold. When departing, the fast food area upstairs is accessible even before check-in or baggage drop is made, and the duty free shop upstairs after the security check accepts euros as well. Taxi drivers have a semi-monopoly for transportation to/from the airport, since there are no city operated buses (GRAS) between the airport and the city anymore. Centrotrans Eurolines, in cooperation with Sarajevo International Airport, provides a bus service Aerodrom (Airport) – Baščaršija (city center), (one-way ticket 5 KM, return ticket 8 KM). There are different timetables for summer and winter, and the bus schedule matches the flight timetable. For the winter timetable valid until March 24, 2018, please click here. Taxi fares to/from the airport are surprisingly expensive for the short distance. Taxi drivers use fake price lists for tourists. The real taxi price to the city is 16 KM. You can also walk 600 m to Dobrinja and take a metered taxi from there (~ 13 KM). Some of the Sarajevo hotels organize airport transfers for guests, too, and the rates may vary from very minimal cost up to exceeding the taxi fares. Getting this bus is not difficult but also not obvious, and it requires a walk of 600 m to 43.8286518.343361 Dobrinja, so be sure to print a map before, Google Maps is accurate. You have to exit the airport at the main gate, this is where the sidewalk ends, so turn right and start walking along the highway. On the left side will be a residential neighborhood called Dobrinja. Walk a couple hundred meters and then cut through the neighborhood to get to another large road that has the bus stop named Dobrinja škola B on Google Maps in front of Mercator Center Dobrinja. This is where the trolley 103 stops every 6 – 7 minutes during daytime. The trolley is very slow, so it will take about 25 minutes to get to Plaza Austrija (Trg Austrijski), which is the final station and in the center of old town, if you cross the Latin Bridge. You can do the same on the way back to the airport. Trolley costs 1.80 KM paid to the driver as of Nov 2017. Be sure to buy a ticket, as controllers are frequent. If you're in the area of the airport, consider checking out the Tunnel Museum (Tunel Spasa) right next to the only runway, it will save you a trip from the city center later on. The 43.8602818.399042 Sarajevo Railway Station (Nova željeznička stanica; address: Put života 2) is the most important station in the city. Travel by train used to be a very popular mode of transportation before the disintegration of Yugoslavia, but infrastructure was heavily damaged during the wars, and train service suffered accordingly. The train station is in a state of disrepair, and only serviced by a few trains per day. Do not expect high speed intercity trains here. The station is right next to the Avaz Twist Tower, which makes it easy to find from anywhere in the city. Inside the building are an information desk, ticket office, toilets, and some bars. The 43.85168218.3464173 Alipašin Most Railway Station (Željeznička Stanica Alipašin Most; address: Safeta Zajke) might be another (secondary) railway station in Sarajevo. The Zagreb-Bosnia train seems to have been cancelled since December 2016. The only international train to Bosnia operates from Zagreb. The journey is quite picturesque, and the journey time is comparable to the bus. There is one daily train between Sarajevo and Zagreb in each direction. Tickets cost 59 KM one-way, 95 KM return. Trains are not air-conditioned, and the toilets aren't great, but otherwise the train is comfortable. Journey times are about 9 hours, but subject to lengthy delays for passport control on both sides of the border with Croatia. A train leaves Zagreb daily at 09:18 arriving in Sarajevo at 18:18. The return train to Zagreb via Zenica, Doboj and Banja Luka departs Sarajevo at 10:43 and arrives in Zagreb at 19:49. Schedule is available here. The train does not have a dining car on board, or any other food provision. Bring supplies beforehand. There are two trains from Čapljina to Sarajevo via Mostar (07:06 and 19:19). There are also two trains daily from Sarajevo to Čapljina via Mostar (07:15 and 18:57). Journey takes 2½ hours and costs 11 KM (October 2017). Roads in Bosnia are often only a single lane in either direction. Due to the mountainous topography roads tend to have many tight bends, so the speed limits are lower (mostly 80 km/h). Beware of trucks and other vehicles dangerously overtaking on any road. Bosnia has many tunnels where you must always drive with your lights on (day or night). However, there has been significant modernisation. GEA Tours, Kneza Milosa 65, Belgrade, ☎ +381 11 2686, +381 635 2686, +381 622 2643, +381 840, +381 268 5043, e-mail: gea@eunet.rs. Provides connections by minivans or private cars between Sarajevo and Belgrade. You must contact them by phone or email before departure. Journey takes about 5½-6 hours. €20 (one-way), €35 (return). There are two bus stations in Sarajevo, the main station and the east station. On all intercity buses you pay a fee for luggage. This fee of 1 KM or €1 per piece of luggage is paid to the driver upon boarding. Some drivers are rather picky about being paid in exact change in the correct currency (sometimes a local currency, at other instances requesting to be paid in euros) and sometimes also refuse to be paid in too small coins. So keep some change ready. The 43.8587718.396914 Main bus station (Autobuska stanica) is next to the train station, at the end of number 1 tram line that takes you to the Old Town (1.60 KM). This bus station serves both domestic and international destinations. It is advisable to buy international tickets in advance since these routes fill up quickly. International tickets can be bought online, at the station, or from the 43.859043318.42593375 Eurolines office near the cathedral between the old bazaar. Information on bus routes can also be obtained from the tourist information offices. There are several buses a day to/from Mostar which also stop at Konjic and Jablanica along the way. These leave at 06:00, 07:00, 07:35, 08:00, 08:15, 09:00, 09:30, 10:30, 11:30, 12:30, 14:30, 15:30 and up to 18:00, and journey time is ~2½ hours. Single tickets cost 13.50 KM, return tickets are 19 KM. There are also buses to Split (7-8 hours) and a daily bus to Dubrovnik which leaves at 07:00 and costs 40-160 KM. There is a bus every day from Pristina in Kosovo at 18:30 from the main bus station. The bus is listed on the station schedule as travelling to Novi Pazar, Serbia. From there it travels on to Sarajevo. You can buy the ticket to Novi Pazar at the bus station, or from the controller on board the bus for the whole journey. You might have to change buses in Novi Pazar (which is surprisingly hassle-free). The price from Pristina to Novi Pazar is €7, from Novi Pazar to Sarajevo is €15, and payment is possible in euros or Serbian dinars. The bus arrives in Novi Pazar around midnight, and Sarajevo around 06:00. Make sure you have the proper travel document to enter Serbia (see Kosovo Get in section) as the controller will not issue you tickets without seeing them first! Another possibility is to book a bus to Podgorica in Montenegro, and then travel from there to Pristina. There is one bus per day from the main station to Belgrade, at 06:00, costing 40 KM. Click here for main bus station time table The 43.8237718.356496 East bus station (Autobuska stanica Istočno Sarajevo 'Lukavica' ) is another bus station in Eastern (Serb-dominated) Sarajevo on the outskirts of the city serving the Republika Srpska and destinations in both Serbia and Montenegro. To get here, it is probably easiest to book/order a taxi (around 15 KM). If using public transport, take 103 or 107 bus/trolleybus, or the 31E, all from Trg Austria and exit at the last station, and ask people how to get to Lukavica bus station (buses and trolleybuses to the city centre depart from a terminal around 200 m from where the international buses arrive). Arriving at Istočno Sarajevo Bus Station, continue on the main road, having the bus station on your right - you will see the Dobrinja trolleybus stop to your right. Buy ticktes at the booth. If you need Bosnian currency there is a Visa/Mastercard cash machine (bankomat) in the nearby Tom shopping centre. To get there walk into the opposite direction of the trolleybus stop, having the bus station to your left. The shopping centre is at the next big traffic light. There are 2 cash machines (Unicredit and NLB) outside and you'll find a supermarket inside. The Lukavica 'Eastern' station is actually to the west of the 'main' bus station, and is basically to the west of most of Sarajevo's suburbs. The bus ride from Lukavica bus station to Podgorica (35 KM) in and Budva (40 KM) Montenegro takes 7 hours (35 KM) but is an absolutely amazing ride through some wonderful countryside on the route Lukavica-Trnovo-Rataj-Foca-Brod-Hum-Goransko-Niksic-Danilovgrad-Podgorica (sit on the right side of the bus for the best views). Buses leave at 08:15, 09:00, 14:00 and 22:30. Payment in euros is accepted. Bus departure times for Lukavica - Belgrade are: 08:00, 09:45, 12:30, 15:00 and 22:00 daily. One way ticket cost 40 KM. From Mostar, hitching a ride through the beautiful mountains up the M-17 road to Sarajevo is quite easy. Make sure you have a sign though and a Bosnian/Croatian/Serbian language phrasebook would be useful. If you have trouble getting out of Mostar, change the sign to Jablanica where traffic will branch of NW to Banja Luka and then hitch on to Sarajevo from Jablanica. Sarajevo is a long thin city so try to get a lift into the centre. If not, get one at least to the tram tracks that go there from the west of the city limits. Sarajevo is a small, beautiful city with many landmarks. Getting lost is next to impossible if you have a map (although getting lost in Bascarsija's winding streets can also be part of the fun!) Very good and free maps can be obtained from the tourist information office, shopping centers, and hotels. A map app on your smartphone is fine, too, and some bookstores may also sell the traditional printed maps of the city. Asking Sarajevans for directions is an exercise in futility. People don't know the names of streets a block from the building they've lived in all their lives. However, they won't tell you this, and as a rule will point you in some direction, usually not the right direction. Taxi drivers can't be expected to find anything but the most obvious addresses unless you tell them where to go, in Bosnian—showing the driver on your map will come in handy. The center of Sarajevo is served by a spinal tram network which makes a counter clockwise loop around the central district. This tram network opened in the mid-1870s and was the first in the Austro-Hungarian Empire, Sarajevo's tram network is therefore among the oldest in Europe. Tickets should be purchased in advance from kiosks labeled tisak on the street or from the driver, where they cost slightly more (1.80 KM, paid in cash). Tickets should be validated upon boarding the vehicle and are valid for a one way trip only. Changing tram or bus means validating a new ticket. A day card valid for unlimited travel on all local public transport in Zone A is available for about 5 KM. Inspectors board public transport very frequently: if you can't reach the validator machine because the tram is too crowded, then don't board the tram. If you are caught without a valid ticket, you will be escorted off the tram and be fined 26.50 KM. The tram network consists primarily of a main line following the flow of the city between Ilidza and Baščaršija (line 3 ), with several minor branches. The public bicycle rental system 43.8582318.423942 Nextbike has 8 stations throughout the city where bicycles can be rented or returned to. Be aware however that traffic in Sarajevo is deadly (see Stay safe), and that bicycle infrastructure in the city is still in its infancy. Only recommended to seasoned urban cyclists. All legitimate taxis are required to have a "TAXI" sign on top and license plates with "TA" on them and to use a taxi meter, but at least for distances longer than 25 km it is also possible to negotiate a rate with the driver in advance (price may be agreed upon but it must not exceed the taxi meter amount). Taxi fares can most likely only be paid in cash and the driver will issue a receipt upon request. The taxi fares can vary, depending on traffic, but from Airport to Baščaršija it could typically cost around 17 – 20 KM. Compared to other European capital cities the taxi fares are quite low: starting fare is 1.50 KM, regular rate per kilometer is 1 KM and 1 KM is charged for each piece of baggage (as of Nov 2017). Holand Taxi, toll-free: 0800 20234. Red Taxi (Crveni Taxi), ☎ +387 33 76 06 00. Samir & Emir Taxi, ☎ 1516 (in country only). Sarajevo Taxi, ☎ +387 33 1515 , +387 33 523 156 , +387 61 230 666, e-mail: taxi@bih.net.ba. Yellow Taxi (Žuti Taxi), ☎ +387 33 663 555. With the exception of the Tunnel Museum and the Bosna spring, all landmarks are located in or around the old town, or reachable on a walking distance. Several walking tours are available, a free guided tour starts every day at 10:30 at the crossing of Gazi Husrev begova street and Mula Mustafa Baseskija street (address: Velika Avlija 14) and covers most of the Baščaršija. Baščaršija is the historic district of Sarajevo. The cobbled streets, mosques and oriental-style shops at the heart the city feel like a world away from Europe when the call to prayer starts. You could be walking by a Catholic church, Orthodox church or a synagogue and hear the Islamic call to prayer at the same time. In this old bazaar you can find dozens of shops selling handmade copperware, woodwork, and sweets. Many historic monuments are situated around Gazi Husrev-begova street. Sebilj, the most iconic fountain of Sarajevo in the Baščaršija district. 1 2 3 5 Baščaršija, Pigeon Square). 24/7. Pseudo-Ottoman wooden fountain in the middle of an open square in the old town of Sarajevo. It was built by Mehmed Pasha Kukavica in 1753, and under Austro-Hungarian rule moved to its current location in 1891 by Austrian architect Alexander Wittek. Three replicas of the fountain exist, respectively in Belgrade and Novi Pazar in Serbia, and in St. Louis. The fountain offers shadow and drinkable water to travelers. The surrounded Pigeon Square got its name from the countless pigeons swarming around. Feeding pigeons is allowed, and a seller with a mobile trolley sells corn to tourists to feed the birds. Free. 1 2 3 5 Katedrala), ☎ +387 33 210 281, toll-free: +387 33 225 591, e-mail: mestar47@bih.net.ba. Tu-Su 09:00-17:30. The largest Christian cathedral in Bosnia, and the seat of Archbishop of Vrhbosna. It was built in honor of the Sacred Heart of Jesus in a neo-gothic style with Romanesque Revival elements, and modeled after the Notre-Dame of Dijon. Construction of the cathedral began on 25 August 1884, under Austro-Hungarian reign, was carried out by the Viennese contractor Baron Karl Schwarz, and supervised by architect Josip Vancaš. The cathedral was the scene of peace demonstrations in fall 1991 before the Bosnian War broke out, and subsequently damaged during the Siege of Sarajevo. The design above the door to the entrance is part of the flag and seal of the Sarajevo administrative canton and the Romanesque towers are featured on the flag and coat of arms of Sarajevo, making the building a symbol of the city. The niche above the portal features an octagonal rosette and a statue of the Sacred Heart. The interior of the cathedral was designed by architect Josip Vancaš, including the main altar which is made from Grisignano marble and rests on four columns of red Tyrolean marble. The frescoes were commissioned to Alexander Maximilian Seitz in 1886 but due to deteriorating health, they were only completed in 1887, and he died a year afterwards. Most of the actual work was undertaken by his assistant Alberto Rohden. A prominent feature is the grave of archbishop Stadler, the first archbishop of Vrhbosna, and the sculpture is of the hand of Marin Studin. The stained-glass windows ornamenting the cathedral were manufactured by the Viennese workshop of the Tiroler Glasmalerei (German for glass painting artisan). An English mass is held on Sundays at 12:00. For candles, ask the information desk at the entrance (1 KM each). Free. Entrance of the Morića Inn. 1 2 3 5 Baščaršija, entrance is on the south side of the block, from the Sarači street), ☎ +387 33 236-119. 08:00-22:15. The only preserved Ottoman Inn (han literally means roadside inn) in Sarajevo, built in 1551, under the benevolence of Gazi Husrev-Beg's endowment (vakuf). It served as a caravanserai, able to accommodate up to 300 guests, 70 horses, and offered 43 rooms where travelers could spend the night. On 29 July 1878, the inn became the scene of the protest movement against the Austro-Hungarian occupation of Bosnia, and the People's Council (Narodni Odbor) was founded here. The building was damaged or destroyed by fires numerous times and rebuilt each time, notably in 1697 and most recently in December 1957 when the entire complex was burnt to the ground. Reconstruction took place from 1971 to 1974, and Persian calligraphic inscriptions from poems written by Omar Khayyám, a 12th-century Persian poet, were added as decorations. The property ownership to the inn was returned to the Gazi Husrev-Beg endowment in 1998, and houses a carpet shop and traditional restaurant, occasionally hosts exhibitions, and offers business space for purposes that match the historical context and purpose of the building. Stairs on either side of the inner patio allow visitors to reach the first floor with the rooms. Free. 43.859218.42864 Clock Tower (Sahat-kula), Mudželeti veliki (next to the Gazi Husrev-bey's Mosque), ☎ +387 62 626 626. The clock tower, at 30 metres, is the tallest in all of Bosnia, and dates back to the 17th century when it was constructed by Gazi Husrev-beg next to the mosque that also bears his name. The tower has a staircase with 76 wooden steps arranged in a square, and displays the time on all 4 sides. When Eugene Savoy of the Austrian army laid siege on the city in 1697 and looted it, the tower was set on fire, but restored in 1762. After the Austro-Hungarian occupation, the upper part of the tower was upgraded, and the decaying Turkish clock mechanism was replaced by a new one from Gillet & Johnston, made in London in 1873. The original clock mechanism was moved to the Vratnik mosque where it remains on display until today. The last upgrade dates from 1967, when the dials were gold-plated. A peculiarity of the clock tower is that it appears to be the only remaining clock tower in the world that displays the lunar clock (a la turca, lunar reckoning). This method of measuring time counts hours up till the moment of (astronomical) sunset instead of midnight, as with contemporary time calculation, so the hands are in the 12 o'clock position at every sunset, when a new day also begins. Since the setting of the sun is uneven throughout the year, the time needs to be manually controlled and recalibrated every 2 to 3 days. The task of recalibrating the clock was assigned to the muvekit (timekeeper), who used astronomical instruments in a special room called the muvekithana to calculate the position of the sun. The current muvekit, Mensur Zlatar, who works at a nearby jewellery shop, has been assigned the responsibility since 1960s. The exact timing of the sunset used to be an important moment for locals to schedule their time of prayer, but the original religious purpose behind the lunar time has long since had its meaning forgotten, causing many to think that the clock is simply bad at proper time keeping. In 2006, the Commission for the Preservation of National Monuments proclaimed the clock tower as a national monument of Bosnia and Herzegovina. The tower cannot be visited, but it is possible to stand at its base by following the tunnel leading to Pekara Imaret right next to the tower. Ruins of Tašlihan between Hotel Europe and the bezestan. 1 2 3 5 Latinska ćuprija). 24/7. Tašlihan served as one of the three stone caravanserais in Sarajevo (the others being the Morića Han and Kolobara Han), the name literally translates to 'stone han'. It is believed that Tašlihan was the largest and most representative inn of its kind in the region, and built between 1540-1543 by craftsmen from Dubrovnik, who equipped the building with lead cupolas unlike the other two inns. It had a square foundation with sides of 47m, guest rooms on two levels, and a fountain in the courtyard. Several fires damaged the building, and the last one in 1879 completely destroyed it. The last remaining bits of rubble were removed in 1912, except for the shared wall with the bezestan. When archaeological research was carried out as part of the 1998 renovation of adjacent Hotel Europe, the remains of Tašlihan were uncovered in the hotel's garden. The site was declared a National Monument of Bosnia and Herzegovina by the Committee for the Preservation of National Monuments in 2004. Free. Interior of the City Hall. 1 2 3 5 Vijećnica), ☎ +387 33 292-800, e-mail: kontakt@vijecnica.ba. 10:00-20:00. Iconic pseudo-Moorish revival style building in Sarajevo, constructed between 1892 and 1894 under Austro-Hungarian occupation of the city. It was designed in 1891 by Czech architect Karel Pařík, but after disagreements with the ministry, it was Alexander Wittek who continued work on the project from 1892 to 1893 until he fell ill and died in Graz in 1894. The work was completed in 1894 by Ćiril Iveković, at a total cost of 984,000 crowns. The city hall was formally commissioned in 1896 by the City Authority which occupied the building until 1949, after it became the National and University Library of Bosnia and Herzegovina. On 25 August 1992, the building was set ablaze by Serbian shelling at the beginning of the Siege of Sarajevo, causing its complete destruction. Most of the 1.5 million volumes in the library's collection, of which 155,000 rare books and manuscripts were lost in the fire, despite civilian efforts to save them. Vijećnica was restored between 1996 and 2013 with financial aid from Austria, the European Commission and the city of Barcelona, at a total cost of 25 million KM. It is now a national monument, reopened since 2014, and designated as a cultural building for protocol events, concerts and exhibitions. 5 KM. 1 2 3 5 Posta), ☎ +387 33 226-431, e-mail: info@nps.ba. The National Theater was founded in 1921, with an opening ceremony led by Branislav Nušić, then Head of the Art Department of the Ministry of Education. On November 9, 1946, the Sarajevo Opera House commenced its artistic activity with the premiere of B. Smetana's The Bartered Bride. The ballet division was also founded in 1946, but the first independent performance, The Harvest by Papandopulo, was postponed until May 25, 1950. The current building, built in 1899 as a Country House (which was also known as the "Gentlemen's Club" or "Clubhouse"), was designed by Czech architect Karel Pařík, who contributed to over 160 buildings in and around Sarajevo. Due to its disposition and structure, one of the first city squares in Sarajevo was formed in front of the National Theatre. 1 2 3 5 Drvenija), ☎ +387 33 285-800. The Officers’ Casino was built in 1881 according to Karl Pařík’s design. It was the core of Sarajevo’s social life in late 19th and early 20th century. The Army Hall of Bosnia and Herzegovina has been used by the military ever since its establishment for various purposes, such as art exhibitions and public lectures. It holds two grand halls for receptions and cultural events, and was the venue of the first military music concert in the city, held in 1881. Sarajevo hosts numerous museums on a variety of topics. The museums can offer an air-conditioned refuge from heat during Sarajevo's hot summers, or a place to warm up in the chilly winter months. 1 2 3 5 Vijećnica, the entrance is on the eastern side of the block), ☎ +387 33 239-590. M–Sa 10:00–16:00. The museum traces Sarajevo's development from prehistorical times through the Roman, Ottoman, Austro-Hungarian and modern times. This is a tiny museum but the cost of 3 KM is worth it. The entire time spent in here will probably be less than half an hour. The centerpiece of the museum is a model of the Old Town on the ground floor, made by Husein Karišik in the 1950s, depicting the era when Tašlihan was intact. On the second floor there is a famous blue garment (with golden threads) and some fine yataghan (short Turkish sword) on display among other items. 3 KM. National Museum (right) and Parliament building (left). 1 2 3 5 6 Muzeji, in a large classical building across the road from the Holiday Inn), ☎ +387 33 668-027, e-mail: kontakt@zemaljskimuzej.ba. Tu-Su. Static displays of the natural and human history of Bosnia and Herzegovina - including an exhibition of traditional Turkish-style homes of Sarajevo prevalent in the nineteenth century, an extensive collection of insects and stuffed mammals and a large geology section with samples from around the world and a number of meteorites. The newly reopened museum also offers access to the botanical garden in the middle of the four main buildings: (1) archaeology from the Roman period up to the ninenteeth century, (2) Library, (3) Ethnology and (4) Natural sciences. 6 KM. The Austro-Hungarian Empire had occupied Bosnia and Herzegovina since 1878, but provoked unrest in the Balkan by formally annexing the territory in 1908. This angered Serbia and its ally, the Russian Empire. Anti-Austrian sentiment soared in Orthodox countries, which culminated in the assassination of Archduke Franz Ferdinand of Austria, heir to the throne of the Austro-Hungarian Empire and his wife Sophie, by 19 year old Serb student Gavrilo Princip in 1914. The assassination took place when Franz Ferdinand and Sophie passed the Latin Bridge in Sarajevo, in front of what is now the 1878-1918 Museum, after he returned from a banquet in the City Hall to celebrate a previous unsuccessful assassination attempt. The Austro-Hungarian Empire responded by declaring war on Serbia and its allies, which set in motion a series of political events resulting in the First World war, and with it the end of the Austro-Hungarian Empire. Sarajevo Museum 1878-1918, where the assassination of Archduke Franz Ferdinand occurred. 1 2 3 5 6 Muzeji), ☎ +387 33 533-288. M-Sa 10:00-16:00. The museum is dedicated to the Austro-Hungarian occupation of Sarajevo, which started with the Berlin Congress in 1878 and ended with World War I in 1918. The exhibition portrays life in the Austro-Hungarian era from different perspectives and themes, including the resistance against the occupation, lifestyle, culture, religion, industry and architecture. The time line ends with the assassination of Archduke Franz Ferdinand and his wife Sophie in front of the building. In the museums collection are numerous artifacts and photographs, along with wax statues of Franz Ferdinand and Sophie. 43.862418.429312 Svrzo's House (Svrzina kuća), Glođina ulica 8 (200 m north of the old town), ☎ +387 33 475-740. M-Fr 10:00-16:00, Sa 10:00-15:00. Part of the Sarajevo City Museum, Svrzo's House shows the living conditions of a Muslim family at the end of the 17th century. The house was built by the eminent Sarajevo family Glođo during the Ottoman occupation of the city, but ownership was transferred to the Svrzo family since the Glođo family had no male successors. The interior is divided in two sections: the public part (selamuk) and the family part (haremluk), which in turn is split in the traditionally separated living quarters for men, women and servants. Despite being constructed entirely out of wood, the building was surprisingly well preserved until the Siege of Sarajevo during which it sustained heavy damage. It was rebuilt after the siege and reopened in 1997, and renovated again in 2005. 3 KM. 43.8596918.4284813 Gazi Husrev-Bey's Library Museum (Muzej Gazi Husrev-begove biblioteke), Gazi Husrev-begova br. 46 (next to the Gazi-Husrev beg Mosque), ☎ +387 33 238 152, fax: +387 33 205 525, e-mail: info@ghb.ba. M-Fr 09:00-18:00, Sa closed, Su 09:00-16:00. The new Gazi Husrev-bey Library building also houses a museum with a collection of over 1200 items. This permanent exhibition displays Islamic calligraphy, time measuring tools and everyday life objects of Muslims. The price of a museum ticket is 3 KM. Apart from the museum the Gazi Husrev-bey Library holds around 100,000 units (manuscripts, printed books, periodicals, and various archive documents), but access to the Library funds and reading rooms is restricted to members only. The registration of any potential library user is made in a membership card valid for 12 months (30 KM, but also a daily membership (3 KM) is listed on the Service Price List). Entry to the library, exit, and membership identification are made at the Reception Desk of the Library. When entering a reading room, visitors must provide a membership card and an identification document that shall be returned to them upon exit. 3 KM. Scars from the Bosnian War can still be seen in many parts of the city, as bullet holes in walls or abandoned buildings. The unresolved conflict (see box The Yugoslav Wars) left traumatic memories, and museums and memorials associated with the Bosnian War are scattered around the city. "Sarajevo Roses" are scars left in the concrete from mortar blasts during the Siege of Sarajevo, filled with red resin. Around 200 can be found throughout the city. The Tunnel of Hope under the airport. 43.81972218.33722214 Tunnel of Hope (Tunel Spasa), Ulica Tuneli 1, 71210 Ilidža (The museum is reachable by foot from the airport, or by tram 3 from the Sarajevo city center, then bus 32a (Ilidža - Butmir). Get off at Donji Kotorac okretnica and turn left into Ulica Tuneli between the islamic cemeteries. The tunnel is in the garden of a house so don't be worried if you think you're headed into suburbia. Taxi fare from the Sarajevo city center (costs ~17 KM one way). Alternatively, the tourist office in the city centre and Sarajevo Funky Tours offers tunnel tours for €12, with transportation to and from the city centre included. After seeing the tunnel, they also take you on a drive through the part of the city that is in the Republika Srpska, which you can't get to via the tram), ☎ +387 33 684 032, e-mail: info@tunelspasa.ba. Apr 2-Oct 31: daily 09:00-17:00; Nov 1-Mar 31: daily 09:00-16:00. The museum houses the Butmir entrance of the Sarajevo tunnel which, during the Siege of Sarajevo, served as the only connection of the isolated and besieged city to the outside world. The tunnel, dug by Bosnian forces in 1993, bypassed the UN blockade of the airport by tunneling under the runway over a distance of 340 meters. The tunnel allowed arms, munitions, oil and food to be transported into the city, and served as an evacuation route for officials and civilians. In a later stage of the war, a pipeline for oil and cables for electric power and telecommunications were also installed. Aside from a small segment of the tunnel which can be visited, the museum also offers a wealth of information on the Siege of Sarajevo, with numerous artifacts on display. Last entry 30 minutes before closing (i.e. 16:30). 5-10 KM. Exhibition hall of the War Childhood Museum. 43.8617418.4281115 War Childhood Museum (Muzej ratnog djetinjstva), Logavina 32 (walk north from the bezestan until you see the museum sign to the right of the street), ☎ +387 33 535-558, e-mail: info@warchildhood.org. 09:00-20:00. Opened in 2017, the museum has personal belongings on display that illustrate the experience of a childhood during the Siege of Sarajevo. An audio guide reveals the stories behind the items, complementing the exhibits with additional pictures, audio and video. Video testimonies of inhabitants who grew up during the war are also shown throughout the visit. Only around 50 are in the permanent collection at any time, but the book War Childhood offers a compilation of them all. The book is for sale in the museum or can be consulted for free in the library section. 10 KM. 1 2 3 5 Banka, at the end of Marsala Tita street and beginning of Ferhadija street). 24/7. Memorial site designed by architect Juraj Neidhardt, honoring the victims of World War II with an eternal flame and inscription. The memorial was dedicated on 6 April 1946, the first anniversary of the liberation of Sarajevo from the four-year-long occupation by Nazi Germany and the fascist Independent State of Croatia. Free. After the disintegration of the Soviet Union in 1991, different ethnic groups in the Yugoslav Federation also started to seek independence. This resulted in a series of armed conflicts in the Balkan region, leading to the independence of Slovenia and Croatia, while the goal pursued by the Serbs was a unified greater Serb state. This conflict of interest caused the Yugoslav army to lose support from Croats and Bosniaks, and effectively became a Serb dominated army, which evolved into the army of the newly created Republika Srpska. When Bosnia and Herzegovina declared independence in 1992, the Bosnian War broke out, and Sarajevo found itself on the front line between Bosnia and the Republika Srpska, resulting in the Siege of Sarajevo. The war concluded in 1995 with independence for Bosnia and Herzegovina, and the formation of an autonomous Republika Srpska within the country. The conflict was overshadowed by heavy civilian casualties and war crimes, including genocide, of which the Srebrenica massacre is the most infamous one. The UN enforced peace treaty froze the conflict rather than resolving it, and anti-Serb sentiments can still be felt in Sarajevo. 1 2 3 5 Katedrala, or continue Ferhadija street from the Sacred Heart Cathedral in the direction of the Eternal flame, the museum entrance is a door to the left of a narrow alley), ☎ +387 62 467 764, e-mail: muzejgenocida@gmail.com. 09:00-22:00. Small museum about the genocide in the Bosnian Civil War of 1992-95. The humanitarian side of the conflict is portrayed with shocking pictures and film fragments of the raw truth of the darkest era in recent Bosnian history. Complementary to the 11/7/95 Gallery, which focuses on the Srebrenica Massacre in particular. Warning: the authentic photographs and video fragments of the genocide may be shocking to young visitors. Parental advisory and visitor discretion is advised. 1 2 3 5 Katedrala, next to the Sacred Heart Cathedral), ☎ +387 33 953-170, e-mail: info@galerija110795.ba. 09:00-22:00. A small but compelling museum with a permanent exhibition about the Srebrenica Massacre, intended as a memorial to the 8372 people who perished during the events of July 1995. The events are unfolded from the perspective of investigative journalists visiting the site of the genocide. The audio guide (3 KM) is highly recommendable. Duration of the visit, with audio guide, is around 60 - 90 minutes. Warning: the authentic photographs and video fragments of the genocide may be shocking to young visitors. Parental advisory and visitor discretion is advised. 12 KM. 2 3 4 5 6 Katedrala). 24/7. Sniper Alley was the informal name primarily for streets Zmaja od Bosne Street (Dragon of Bosnia Street) and Meša Selimović Boulevard, the main boulevard in Sarajevo which during the Bosnian War was lined with snipers' posts, and became infamous as a dangerous place for civilians to traverse. The road connects the industrial part of the city (and further on, Sarajevo Airport) to the Old Town's cultural and historic sites. The boulevard itself has many high-rise buildings giving sniper shooters extensive fields of fire. Signs reading "Pazi – Snajper!" ("Watch out – Sniper!") became common. People would either run fast across the street or would wait for United Nations armored vehicles and walk behind them, using them as shields. According to data gathered in 1995, the snipers wounded 1,030 people and killed 225 — 60 of whom were children. Free. 1 2 3 5 Park). 24/7. Monument erected in 2009 by sculptor Mensud Kečo and dedicated to the 1,600 children who were killed during the Siege of Sarajevo. The monument is located in Veliki Park, and consists of a glass sculpture constructed by stacking individually cut layers of green glass with a total height of 5 m, and is 1.7 m in diameter at its base. In 2010, the names of 521 children were inscribed in seven cylinders of anodised aluminum and placed on a concrete plinth around the sculpture. Free. 1 2 3 5 6 Muzeji), ☎ +387 33 226-098, toll-free: + 387 33 210 416, e-mail: hasimbegovic@muzej.ba. 09:00 - 19:00. The museum was founded 70 years ago, but heavily damaged by shelling during the war and still in a perpetual state of disrepair. The exhibitions primarily focus on the war, but the presentation of the artifacts is outdated, and the museum lacks content overall. Some of the displays are worth a visit, at least if you are able to cope with the graphic pictures. The 11/7/95 Gallery and War Childhood Museum offer similar content for a much better value. 5 KM. 43.879895918.431260623 Museum of the 105th Motorized Brigade (Muzej 105. motorizovane brigade), Grdonj. T-F 12:00-22:00; Sa-Su 10:00-22:00. A memorial dedicated to the 105th Motorized Brigade of the Bosnian Army, which took part in the defense of Sarajevo during the 1992-95 siege of the city. Since 1993, over 7,000 members have passed through the brigade, of which 312 were killed in action and more than 2,000 were wounded. The museum is housed in a renovated fortified tower at Pointy Rock. 43.85777818.42444424 National Gallery (Umjetnička galerija), Zelenih beretki 8, ☎ +387 33 266-550, toll-free: +387 33 266-551, e-mail: info@ugbih.ba. M-Sa 10:00-20:00. Established in 1946 after the Second World War, the National Gallery contains over 6000 pieces of art, with a focus on works of Bosnian interest. Interestingly, the gallery remained open and held exhibitions during the Siege of Sarajevo. It was closed in 2011 and reopened to the public in 2012. The permanent exhibition, Intimacies of Space, highlights Bosnian life from all angles. 43.8577718.426625 Museum of Literature & Performing Arts (Muzej književnosti i pozorišne umjetnosti), Sime Milutinovića Sarajlije 7, ☎ +387 33 201-861. M-F 8:00-19:00; Sa 12:00-20:00. A small museum dedicated to the importance of literature and expressive arts in Sarajevo, with attention to prominent local writers and poets. Worth a visit to those interested in arts and literature. 3 KM. 43.855043218.41453526 Modern Art Museum (Ars Aevi), Terezija bb (Skenderija), ☎ +387 33 216-927, e-mail: arsaevi@arsaevi.ba. Museum for contemporary art. It was formed during the war as a "resistance of culture". It has approximately 130 works by renowned world artists including Italian painter and art theorist Michelangelo Pistoletto, Greek artist Jannis Kounellis, German performance artist and sculptor Joseph Beuys, and American conceptual artist Joseph Kosuth. A new museum building, designed by Italian architect Renzo Piano, is planned to be built in the upcoming years. 43.8575918.4273927 Despić House (Despića kuća), Despićeva 2, ☎ +387 33 215-531. M-F 10:00-18:00, Sa 10:00-15:00, Su closed. A dependency of the Sarajevo City Museum, constructed in several stages during different periods, the oldest parts dating back to the 17th century. The property belonged to the wealthy Serb Orthodox Christian Despić family, which donated the house to the city, which turned it into the Museum of Literature and the Performing Arts. It gained fame as the venue for the city's first theater performances, so it may be regarded as the precursor of modern theater. Together with Svrzo's House, the Despić House presents visitors with the lifestyle of wealthy merchant families that contributed to Sarajevo's growth and prosperity. 43.856059418.417811128 Academy of Fine Arts (Akademija scenskih umjentosti), Obala Maka Dizdara 3, ☎ +387 33 210 369. The Academy of Performing Arts in Sarajevo is a faculty within the University of Sarajevo in Sarajevo, Bosnia and Herzegovina, dedicated to the performing arts. It was officially opened in 1981 with the inaugural Department of Acting. In 2010, it was announced that the Sarajevo Canton and the Cantonal Development Institute would be funding the construction of a 10 million KM building and center for the Academy of Performing Arts, primarily because working conditions for students and faculty have been poor for the past decade. Construction on the new 4,600 m² (49,514 sq ft) center began in mid-2010 in the Centar Municipality. The current (old) building on the south bank of the Miljacka river was built in 1899 as an Evangelistic Church according to Karl Pařík’s design. 43.85632418.417597429 Festina Lente Bridge (Festina Lente Most), Obala Kulina bana (in front of the Academy). 24/7. A modern 38 m long pedestrian bridge over the Miljacka, featuring an unusual looping in the middle. There are seats in the looping, inviting travelers to sit down and enjoy the view. The concept of the bridge was created by three students from the Academy of Fine Arts: Adnan Alagic, Amila Hrustić and Bojana Kanlic. It opened officially on 22 August 2012. Free. 43.860118.425630 Bosniak Institute (Bošnjački institut), Mula Mustafe Bašeskije 21, ☎ +387 33 279 800. 08:00-16:30. The institute is a cultural center focusing on Bosniak culture. It was established by former Bosnian Vice President Adil Zulfikarpašić. The institute is housed in a renovated sixteenth century Turkish bath and includes a library and an art center. 43.8582218.4139931 The Presidency Building (Zgradu Predsjedništva Bosne i Hercegovine), Maršala Tita 16. The Territorial Government Building (today, the official residence of the Presidency of Bosnia and Herzegovina) was designed by Josip Vancas and opened in March 1886. The building is modeled after Florentine Medici Ricardi Palace and reflects Florentine Early Renaissance style. It also houses the Constitutional Court of Bosnia and Herzegovina (Ustavni sud Bosne i Hercegovine) and the Archives of Bosnia and Herzegovina. 43.8545518.4056432 The Parliamentary Assembly Building (Parlamentarna skupština Bosne i Hercegovine), Trg Bosne i Hercegovine 1 (across the Sarajevo City Center), ☎ +387 33 284 450, fax: +387 33 233 480. The Building of the Bosnian Parliamentary Assembly was commenced back in 1954, designed by the architect Juraj Neidhard (who was a close associate of Le Corbusier), and finally built during 1978–1982. At the time it was finished, the building of the Assembly of SRBiH was the only building for that purpose in this part of Europe designed in a modern style. Also houses the Council of Ministers of Bosnia and Herzegovina Directorate for European Integration. The building became an icon of the Siege of Sarajevo after it was shelled by Serb artillery and photographed while on fire in 1992. 43.8563618.4307533 Konak (Rezidencija "Konak"), Ulica Konak 5. The Konak was built as an Ottoman governors’ residence in 1868 in Late Baroque style during the rule of Topal Osman Pasha, an Ottoman vizier. It was built on a site of a former konak (an official residence in the Ottoman Empire). From 1878 to 1918 during the Austro-Hungarian occupation the Konak was the residence of the Habsburg family, and the Austro-Hungarian Emperor Franz Josef resided in Konak during his visit in May, 1910. During the Yugoslav Republic (1918 to 1941) Konak hosted generals, governors, district-prefects and many politicians from around the world. Today, it is a state residence used by the members of the Presidency of Bosnia and Herzegovina. 43.856687718.419866534 Central Post Office (BH Posta), Obala Kulina bana 8, ☎ +387 33 252-834. 7:00-20:00. Austro-Hungarian era post office, designed by Czech architect Josip Vancas, and opened in 1913. It is a monumental building with tall doors leading visitors into a classic caged foyer in Secession style, with some decorative elements resembling the post office of Vienna. It was damaged in May 1992 during the Siege of Sarajevo, but restored in 2001 under supervision of architect Ferhat Mulabegović. Free. 43.8590618.4291735 Bey's Mosque (Begova dzamija), Saraci 8 (in the center of Bascarsija), ☎ +387 33 573 151, e-mail: begovadzamija@hotmail.com. 09:00-19:00. This medieval Ottoman architecture's pearl is a lovely place to visit. It is open to Muslims and non-Muslims, but a visiting woman needs to cover her hair and wear long skirt or dress within the mosque. It is one of the biggest mosques in the region and, for many, the most beautiful one. Bey's mosque is a few hundreds years old and it is the greatest and most important project of the waqf of a Bey that is buried in the mosque's courtyard. The clocktower next to the site (across Mudželiti Veliki street) shows 12:00 at sunset, and was used to synchronize the calls to prayer for all the city's mosques. An entrance ticket to the mosque also gives access to the museum across the street. 5 KM. 43.8573118.4306936 Emperor's Mosque (Careva dzamija), Obala Isa-bega Ishakovića (on the south bank of the river). This is the oldest mosque in Sarajevo, the first one to be built in 1457 after the Ottomans occupied the city. It is the largest single-subdome mosque in the country, constructed under supervision of Isaković-Hranušić who dedicated it to sultan Mehmed the Conqueror. It was destroyed at the end of the 15th century but rebuilt in 1565 and dedicated this time to Suleyman the Magnificent. The mosque was damaged again in the Second World War and most recently during the 1992-95 Civil War, and restoration work on the painted decorations and interior are still pending. The adjacent cemetery hosts the graves of many former city viziers, mullahs, muftis, sheikhs an other prominent historical figures of Sarajevo. There is also a café inside the walls. The mosque is open both to Muslims and non-Muslims, but a visiting woman needs to cover her hair and wear long skirt or dress within the mosque. 43.85791718.41263937 Ali Pasha Mosque (Alipašina džamija), Hamze Hume. The mosque was constructed during 1560–61 as a vakıf (legacy or perpetual endowment) of Sofu Hadım Ali Pasha, the Ottoman former governor of the Bosnia Eyalet of the Ottoman Empire, after his death in September 1560. It was built according to the classical Istanbul architectural style. The dome covers the prayer area and three small domes cover the cloister. Because of its noble proportions it stands at the top of the scale of all sub-dome mosques that have been constructed in Bosnia and Herzegovina. In the framework of the complex there is a domed burial site (turbe) with two sarcophagus of Avdo Sumbul (d.1915) and Behdžet Mutevelić (d.1915), Gajret activists who died in the dungeons of Arad. The mosque was heavily damaged by Serbian forces during the conflict of the early 1990s, especially the dome. The most recent renovation of the mosque occurred in 2004 and in January 2005, the Commission to Preserve National Monuments issued a decision to add the Ali Pasha Mosque to the list of National Monuments of Bosnia and Herzegovina. 43.858918.4271138 Ferhadija Mosque (Džamija Ferhadija), Ulica Zelenih Beretki (walk down Ferhadija street to the west). The mosque is named after Ferhad Bey Vukovic Desisalic, a Bosnian Sanyak Bey, who had the mosque built in 1562. Archaeological research into the painted decorations inside the mosque, carried out between 1964 and 1965, revealed 6 paint layers dating from different periods. The oldest and most valuable layer, found in the main dome, belongs to a group known as Rumi ornament, and dates back to the 16th century. Next to the mosque is a small cemetery, where members of the Janissary Order and of the old Sarajevan aristocratic families were buried. 43.855986518.429631139 Tomb of the Seven Brothers (Jedileri), Bistrik 8 (take bus 103 to terminus Trg Austrije), ☎ +387 33 712-800, toll-free: +387 33 71 28 01, e-mail: jedileri1@bih.net.ba. The history of the tomb dates back to the founding days of Sarajevo, and it is assumed that a certain sheik who had arrived with the army of Sultan Mehmed II el-Fatih was the first to be buried at this spot. The sheik built his house next to the current tomb, and in his will asked to be buried at the base of his garden, with the remaining area used as Muslim cemetery. Later on, two dervishes were also buried here, falsely accused of stealing gold from the Sarajevo treasury in 1494. Over two centuries later, 4 army commanders who were accused of collaboration with Prince Eugene of Savoy in his raid of the city, were also buried in the tomb after, according to the legend, a heavenly light descended upon their grave as evidence of their innocence. Thus, the tomb unites the 7 individuals, who are brothers by faith rather than brothers by birth. In 1815 a wall with seven windows was built around the tomb, and a room for a tomb keeper was added. Some of the property was demolished in 1937, but the wall and tomb still stand today. 43.8646718.4292540 Hajji Sinan's Tekke (Hadži Sinanova tekija), Ulica Alije Đerzeleza 1. Thursday: 19:00 - 22:00. The tekke was built by Hadzi Sinan Aga, a wealthy merchant from Sarajevo, or his son Mustafa-Pasha, who was a silahdar (an officer in charge of the weapons) at Murad IV Sultan's Court, from 1638 to 1640. The tekke is comprised of several rooms: a room where zikr (the Dervish prayer) is performed, the sheik's residence, musafirhana (a visitor's inn) and an area for coffee making. In addition to regular Dervish rituals, the tekke gathered Sufis (mystics), who practiced tesavuf (mysticism) and studied works in Persian, Turkish and Arabic. Over a hundred inscriptions have been preserved at this site. Sinan Tekke’s greatest visual attraction is the calligraphy design on the wall of the courtyard, known as “Suleiman's Seal”, the rosette design is nearly three meters wide with the words, “There is no God but God, and Muhammad is his Messenger”, painted 12 times in the fresco style. In 1768, the first asylum for psychiatric patients was opened in Hajji Sinan’s Tekke, marking the beginning of organized health care in BiH. Bell tower of St. Anthony's Church in the Fransciscan Monastery complex. 43.85601318.43116442 Franciscan Monastery (Franjevački samostan na Bistriku), Franjevačka 6. The Franciscan Monastery was built in 1894 according to the design of Czech architect Karel Pařík in Gothic Revival style. It houses a valuable collection of paintings, sculptures, an organ, manuscripts and books, as well as the main archive of the Franciscan Province of Bosna Srebrena. Fransciscans have inhabited Sarajevo since 1291, when they arrived by order of Pope Nicholas IV under leadership of Francis of Assisi, and have been respected as the guardians of Bosnia for 7 centuries. The beautiful stained glass windows are of the hand of Ivo Dulcic. The complex survived the 1992-95 Siege of Sarajevo remarkably unscathed, and minor restorations of the facade and stained glass windows were completed by 2006. 43.85597618.43158243 St. Anthony's Church (Franjevačka crkva svetog Ante Padovanskog), Franjevacka. Roman Catholic church in Gothic Revival style dedicated to the Franciscan friar Anthony of Padua. It was constructed in 1853, and the first Catholic church in Sarajevo since 1697 when Eugene of Savoy burned down the Virgin Mary church during his raid of the city. French empress Eugénie de Montijo donated many ceremonial objects to the church in 1864, but these were destroyed when the church burned down during the great fire of Sarajevo in 1879. Due to a lack of funding, the replacement building was constructed out of wood and in 1905 it had to be closed because it deteriorated to the point of collapse. It was demolished in 1912, and architect Josip Vancaš designed and coordinated construction of the current church. The impressive tower took another 2 years to construct, and the church was finally consecrated in September 2014. The current interior dates from 1960s, and contributions from many artists made it into one of the artistically most important churches in the country. The church is classified as a national monument of Bosnia and Herzegovina. 43.858218.425144 Cathedral Church of the Nativity of the Theotokos (Saborna Crkva Rođenja Presvete Bogorodice), Zelenih beretki 1, ☎ +387 33 269 261. The Cathedral is the largest Serbian Orthodox church in Sarajevo and one of the largest in the Balkans. It is dedicated to the nativity of the Theotokos, and erected at the request of the Orthodox parish of Sarajevo, with construction taking place between 1863 and 1868. The church is constructed as a three-section basilica inscribed in a cross-shaped plan, and has five domes. The domes are built on the beams; the central one is much larger than the other four side domes. The church is arched by round elements. The small gilded baroque-style belfry is built in front of the entrance. The interior walls are decorated by painted ornaments. In the lower zones of the walls the painted ornaments are simulating the marble stone construction look. Arches and vaults are decorated in ornaments only. In 1898, the Orthodox Metropolitan Palace was built near the cathedral. 43.8602518.4300145 Old Orthodox Church (crkva sv. Arhanđela Mihaila i Gavrila), Mula Mustafe Bašeskije 59, ☎ +387 33 571 065. Also known as the Church of the Holy Archangels Michael and Gabriel (Cyrillic: црква св. Арханђела Михаила и Гаврила) is a Serbian Orthodox church. It was first mentioned in Ottoman sources dating to 1539. The church was built on older foundations, and is one of the oldest sacred buildings in the region, built in a medieval Serbian-Byzantine architectural style. Its interior is known for outstanding woodcarving art, paintings, and contains the fifth largest collection of religious icons in the world with a total of 140 icons present, dating from the 13th to 19th century. Among its collection are also 13 historic books and 37 liturgical garment items. The bell tower was constructed in 1883 and renovated in 1960. The site was declared a National Monument of Bosnia and Herzegovina in 2006. Neo-Romanesque St. Joseph church with characteristic bell tower. 43.8564818.4069746 Church of St. Joseph (Crkva sv. Josipa), Ulica Fra Anđela Zvizdovića (across the Sarajevo City Center). Roman Catholic church with 3 bells designed by Karel Pařík in a Romanesque Revival style, funded by Pope Pius XI. Construction began in 1936 and the building was consecrated in 1940, during the early months of the Second World War. The triple aisled basilica is built on top of a sanctuary with a crypt containing the tomb of Archbishop Ivan Šarić. The high altar of St. Joseph and the terracotta Stations of the Cross were gifted by Pope Pius XII. There are a total of 15 tombs in the walls of the church, hand carved by sculptor Franjo Rebhan. The stained glass windows were designed by Ivan Marinkocić, but destroyed at the end of the war in 1945, and subsequently restored. It was damaged again during the 1992-95 Bosnian civil war, restored in the early 2000s, and classified as a National Monument of Bosnia and Herzegovina. 43.85326118.39090647 Church of the Holy Transfiguration (Crkva Svetog Preobraženja), Ulica Zmaja od Bosne 43. Orthodox church designed by Alexander Deroko and built in 1940 in Byzantine Revival style. It was originally planned to be built in Split, owning its resemblance to similar buildings along the Adriatic coast, but eventually constructed in Sarajevo instead and consecrated by Serbian patriarch Gravillo V. It is the primary place of worship for the 50,000 Orthodox Christians in the region. The church has been the target of numerous attacks throughout its history. It was heavily damaged during the 1992-95 Siege of Sarajevo but renovated in 2003. Reworking of the valuable frescoes began in 2004. In 2016, the church was set on fire by pyromaniacs, without injuries. It was targeted by looters again in the same year, and 2 rare icons were stolen. 43.86856718.411335848 Mausoleum of Gavrilo Princip (Groblje Sveti Marko), Patriotske lige (follow Marsala Tita, pass the park, take Kosevo and walk half an hour uphill). 24/7. Cemetery of St. Mark, with a chapel doubling as the mausoleum of Gavrilo Princip, the assassin of Archduke Franz Ferdinand and his wife Sofie at the Latin Bridge in 1914. Gavrilo Princip was buried here together with other Serb revolutionaries beneath the chapel. There is a plaque on the wall of the chapel to commemorate for eternity our Serb heroes. Free. The Jewish population has traditionally co-existed peacefully with other religions in Sarajevo for over 500 years, and includes Sephardis and Ashkenazis. Most Ashkenazi Jews arrived in Sarajevo during Austro-Hungarian rule in the late 19th century, while Sephardi Jews joined during the interwar period. At its peak, 12,000 to 14,000 Jews lived in Sarajevo, comprising 20% of the city's population. The turning point was the invasion of Nazi forces during the Second World War, with a destructive effect on Jewish properties, and the holocaust thinned their numbers. Many Jews fled to the newly formed state of Israel after the war. During the 1990s civil wars, an estimated 15,000 Jews living in former Yugoslavia were evacuated to Israel. Fewer than 1,000 Jews remain in Bosnia and Herzegovina today. 43.8597318.42781449 The Jewish Museum (Muzej Jevreja), Velika avlija bb, ☎ +387 033 535 688. M-F 10:00-18:00, Su 10:00-15:00, Sa closed. The Jewish Museum is housed in the oldest synagogue in Bosnia, built in 1581, which was called the Grand Temple (Il kal Grandi) or the Old Temple (Il kal vjezu) during its long history. It's a three-nave building with the front area used for preaching and the upper floors used as the women's section. Many Sephardic Jews arrived to Sarajevo at the beginning of the 16th century after being expelled by the Queen Isabella and King Ferdinand II of Aragon (along with the Spanish Muslims) in the late 15th century. Ottoman sultans granted them civil rights, equal opportunity, freedom of trade and protection. The Jewish Museum is a memorial to the sheltered world in which Jews in the country lived for centuries, and their contributions to the development of many fields, particularly in science and arts. Particular attention of the museum (the entire third floor) is devoted to the suffering of Jews during World War II, during the 4 years of Nazi occupation of Bosnia and Herzegovina. KM 3. 43.8562918.4250550 Ashkenazi Synagogue (Aškenaska sinagoga), Ulica Hamdije Kreševljakovića 59, ☎ +387 33 229-666. The only functioning synagogue in Sarajevo, designed by Karl Pařík and built in 1902 for the Ashkenazi Jews who arrived in Sarajevo during the Austro-Hungarian rule. The Ashkenazi synagogue escaped nazi destruction, and took on the role of active synagogue of Sarajevo after the holocaust. It was designed in a Moorish Revival style, which was a popular choice for synagogues in the Austro-Hungarian Empire. It features large arches with painted decorations and a ornate ceiling highlighted by a ten-pointed star. A stone menorah at the entrance commemorates the 400-year anniversary of Jews in Bosnia and Herzegovina. Tours are available in English on request. 43.8498118.4079852 Jewish Cemetery (Jevrejsko groblje s kapelom na Borku), Ulica Urijan Dedina. The cemetery lies on the slopes of the Trebević mountain in the Kovačići district of southern Sarajevo. It is one of the largest Jewish cemeteries in South-East Europe, and in use from 1630 until 1966. It was established by Sephardic Jews during the Ottoman period, and also became the burial ground for Ashkenazi Jews after they arrived in Sarajevo in the late 19th century. It contains over 3850 tombstones and stecci, as well as four monuments dedicated to the victims of fascism. It began as a medieval necropolis of stecak tombstones, as still exist in Jablanica and elsewhere in Bosnia and Herzegovina. The Sephardi of Sarajevo created tombstones with a unique morphology, of which the symbolic motifs are not found on any other Jewish monuments elsewhere in the world. The cemetery was the front line during the Bosnian War, and was used as artillery position by the Bosnian Serbs. Several tombstones were severely damaged by bullets and explosions. It was also heavily mined, but completely cleared in 1996. In 2004, the cemetery was declared as National Monument of Bosnia and Herzegovina. Free. During Ottoman rule of Sarajevo, 13 bridges were built over the Miljacka River and Bosna River. Four stone bridges remain: the Latin Bridge, the Šeher-Čehajina Bridge, the Goat Bridge and the Roman Bridge. The Latin Bridge in winter. 43.857518.42888953 Latin Bridge (Latinska ćuprija), Obala Kulina Bana. 24/7. Archduke of the Austro-Hungarian empire, Franz Ferdinand, was assassinated on this bridge on 28 June 1914, sparking the beginning of World War I. A plaque commemorates the event. On the bridge was a memorial to the assassin Gavrilo Princip, but it was removed during the 1992-1995 War. Free. 43.858818.434154 Šeher-Čehajina Bridge (Šeher-Ćehajina ćuprija) (between the City Hall and House of Spite). 24/7. Built in 1585/1586 and survived major damage from flooding in 1619, 1629, 1843 and 1880, but was repaired each time. When the Miljacka River was dammed in 1897 to regulate the water flow, the riverbed was altered and one of the original 5 arches of the bridge on the left bank was buried, a subtle change that can still be seen by observers with a keen eye. According to the legend, the city's vizier Hadzi Husein had ordered to erect the bridge and embed a diamond in one of its pillars to finance future repairs. One night the diamond disappeared, and a poor young man confessed to have stolen it as a gift to a girl he fell in love with. Swayed by the love between the two and the return of the diamond, the man was released from prison, but the diamond was never embedded back into the bridge. In 2005, the Commission for the Preservation of National Monuments declared the bridge a National Monument of Bosnia and Herzegovina. Free. 43.831618.286155 Roman Bridge (Rimski most) (on the Bosna half way between Ilidza and the Bosna spring). 24/7. Crossing the Bosna River at the historic Western entrance into the city. It is the only preserved stone bridge over the Bosna River, and considered one of the most authentic Ottoman bridges in the country. It was built out of carved stone between 1530 and 1550 using lime mortar and stones from ancient neolithic, Illyrian and Roman settlements in the bridge's vicinity, most importantly the Roman village Aquae Sulphurae (Latin for sulfur waters) which served as the region's cultural and administrative center. Numerous archaeological artifacts from that period (jewelry, coins, ceramics etc.) from the Roman period have been found around the bridge. Some of the stone tiles (kaldrma) have shallow engravings of Roman origin, from which the bridge derived its name. Free. 43.85361118.45722256 Goat’s Bridge (Kozija ćuprija) (follow the Dariva scenic walkway East from the City Hall until the bridge). 24/7. Architecturally interesting bridge at the historic Eastern entrance into the city. It had an important ceremonial function, as it served as the place where each Ottoman vizier was welcomed by the previous vizier and citizens of Sarajevo. The bridge is constructed from white marble, has a single arc with two circular apertures, and is 42 m long and 4.75 m wide. The span of the main arc is 17.5 m. According to the legend, before the bridge's existence, a poor shepherd noticed his goats sniffing on a shrub along the Miljacka River. Upon inspecting the shrub, he found a treasure with golden coins, which he used to finance his own education. After he became wealthy and influential, he had the bridge constructed at the shrub where his goats found the treasure, which gave the bridge its name. The truth in the legend was lost in history, but the bridge was almost certainly built between 1565 and 1579, a time when the road network underwent major infrastructure upgrades under reign of Mehmed-paša Sokolović. Free. The Vratnik neighborhood was built in the 18th century, around the fortified Vratnik town. The walls, gates, and fortifications along the Vratnik perimeter can be visited. 43.8614618.437757 Yellow Fortress (Žuta tabija) (Walk through the war cemetery at the eastern end of Bascarsija. Another way is to follow the river upstream; where the road forks, take the right fork (the left fork goes into a short tunnel); follow it past Hotel Sara and up to the fortress.). Yellow Fortress (or Yellow Bastion) is a small cannon fortress at Jekovac. It was built close to the Jajce Barracks and the Jekovac water reservoir. It served as one of the defense points against the Austro-Hungarian troops in 1878. The fortress was damaged and rebuilt several times. The most recent renovation took place in 1998. Offers a great view over the city. Picnic tables with a scenic view are available free of charge, the café sells drinks but these are expensive so it is recommendable to bring your own beverages. Free. Ruins of the White Fortress, for the adventurous traveler to explore. 43.8593818.4445658 White Fortress (Bijela tabija) (follow the road uphill from the Yellow Fortress, take right at the intersection and climb the stairs at the end of the street, there take right until you end up at the fortifications). 24/7. White Fortress is a fort which also formed part of the walls of the Old Town of Vratnik. The fortress overlooks Sarajevo with the panoramic views of the city and eastern entrance to Sarajevo and the Miljacka River canyon. Some reports date the fortress to be built around 1550. The Fortress was renovated and expanded several times; the present-day structure dating back to the Austro-Hungarian period. It served as a dungeon, barrack, munitions storage, a treasury, as well as the protection against the raid of Prince Eugene of Savoy in 1697, and defense fortress in battle against occupation by the Austro-Hungarian ruler in 1878. It is possible to reach the outer ridge by climbing through the "windows", but there is no fence or other safety measures. If visiting at sunrise/sunset it is recommended to bring a flashlight, as the fortress is unsupervised and unlit. Due to the hazards, not recommended for kids. Free. 43.8618218.445659 Visegrad Gate (Višegradska kapija (Zidine Vratničkog grada)). One of the three gate-towers in the Vratnik Old Town. It was built between 1727 and 1739, in limestone and in special Bosnian stone hreša with roof shingles. Traffic went east via the main road towards Visegrad (thus the name) and continued further to the east towards Istanbul. View over Sarajevo from the White Fortress, Jajce Barracks to the left. Museum of Alija Izetbegović in the Ploča Gate. 43.86318.4364560 Museum of Alija Izetbegović (Muzej Alija Izetbegović), Kapi-kula Ploča, Kovači, ☎ +387 33 237-220, e-mail: info@muzejalijaizetbegovic.ba. Apr-Sep: M-F 10:00-18:00, Sa 10:00-15:00; Oct-Mar: M-F 10:00-16:00, Sa 10:00-15:00. A small museum housed in Vratnik's old city gates, Ploča and Širokac, dedicated to Alija Izetbegović, the first president of the independent country of Bosnia and Herzegovina. It has a library of Alija's work and a few personal items on display. The first floor takes visitors through Alija's life, with exhibit panels and historical photographs, and awards and recognitions he received throughout his life and after his death. A passage between Ploča Gate and Širokac Gate is dedicated to Alija's role as commander of the army. His tomb can be visited on the nearby cemetery. Alija Izetbegović tomb in the Kovači Memorial Cemetery at dusk. 43.8615518.4354961 Martyrs' Memorial Cemetery Kovači (Sehidsko mezarje Kovaci), Sirokac (follow Kovači street uphill from Sebilj). Cemetery with victims of the 1992-95 Civil War, and mostly known for the tomb of Alija Izetbegović, the first president of the independent Republic of Bosnia and Herzegovina (1992-1996) after which he became the president of Bosnia and Herzegovina and served until 2003. His tomb, central in the cemetery, consists of a dome suspended on 8 marble pillars, and is during the day guarded ceremonially by members of the army, as a memorial to his role of commander of the army. Free. 43.860918.439762 Jajce Barracks (Jajce kasarna), Bijela česma (walk uphill from the Yellow Fortress and take the stairs to the right before Haris Youth Hostel). A military barracks built in 1914 for the needs of the Austro-Hungarian army, previously known as the Eugen of Savoy barracks. The name Jajce dates from 1915 when the Austro-Hungarian military hospital was moved to the barracks. The building was heavily damaged during the 1992-95 Civil War and has not been restored yet, much of it lies in ruins. It is a popular attraction for urban explorers. Sarajevo hosted the 1984 Winter Olympic Games, officially the XIV Olympic Winter Games. It was the first Winter Olympics held in a socialist state, and the second overall Olympic Games in a socialist state after the 1980 Summer Olympics in Moscow. The infrastructure has suffered from lack of funding, low public interest, and damage from the 1992-95 Civil War. 43.8603418.4227563 Olympic Museum (Olimpijski muzej), Alipašina bb, ☎ +387 33 226 414, e-mail: okbih@okbih.ba. M-F 09:00-17:00. A museum aimed at the preservation of the memories of the organization of the 1984 Winter Olympics in Sarajevo. From 1984 to 1992, the museum was located in the city center, in a mansion owned by Nikola Mandić, former Sarajevo citizen and later president of Croatia during the Nazi occupation in WWII. Declared an enemy of the state at the end of the war, Nikola Mandić lost his life and property, and the mansion was donated to the museum by the Sarajevo city council. At the start of the 1992-95 Civil War, the building was shelled by Serb forces and damaged beyond repair. A significant part of the museums collection went up in flames. The remaining collection was salvaged and transferred to the Zetra Olmypic Complex, and in 2004 the new museum at its current location was opened to celebrate the 20th anniversary of the 1984 Olympic Games. 43.85456118.41408364 Skenderija, Terezija BB (take tram 6 until Skenderija terminus), ☎ +387 33 201-203, toll-free: +387 33 211-016, e-mail: info@skenderija.ba. Tito-era cultural and sports center on the south bank of the river, constructed in 1969 and opened with the premiere of the film Battle of Neretva. It was later expanded for the 1984 Winter Olympic Games, and features a market and shopping mall. Because of its concrete construction, it only sustained minor damage during the war, but gradually decayed afterwards due to neglect. In February 2012, after a record snowfall in Sarajevo, the roof of one of the halls collapsed under the snow pressure, which was estimated to be around 160 kg/m². The building was subsequently restored by the city and returned to service, and receives 500,000 visitors per year. WARNING: As part of the Siege of Sarajevo from 1992-95, extensive mine fields were laid in the hills around the city, of which most had no or inaccurately recorded locations. Although extensive demining efforts were carried out and are still ongoing, land mines may still be hidden in the forests. Never leave paths when walking in the hills around the Olympic facilities, and never enter abandoned buildings. 43.84111118.44222265 Trebevic Bobsled Track, Apelova Cesta (You can walk here [6 km from center, but very steep slope] or ask a taxi to drop you off at Hotel Pino [8 km from center, pay approximately 12–15 KM] then cross the road from the hotel.). Place where bobsled competition takes place during 1984 Olympic Games. Partially destroyed during war. Amazing place for people who like to see ruins. This is also great place for risk takers: you can rent a bike in city and ride down in concrete bobsled path (or hike down if you don't have a bike). A view from the Avaz Twist Tower at dusk. The monthly Sarajevo city guide "Sarajevo Navigator" seems to be available also online (read-only). 1 4 Željeznička stanica, next to the railway station), ☎ +387 33 281 350. 07:00-22:00. The tallest building in the former Yugoslavia, towering 172 meter above the city, and in the top 11 most significant twist towers in the world. Construction started in 2006 and finished in 2008. The tower features a bar/restaurant at level 35, and an observation deck with outside walkway at level 36, offering a magnificent view over the city, with views as far as the airport if weather permits. To reach the bar/restaurant and observation deck, take the elevator around the corner in the entrance hall and get to level 35 (from where stairs lead to the observation deck). Access to the bar/restaurant is free, but access to the observation deck requires an entrance fee of 1 KM. The access gate only accepts coins of 1 or 2 KM, but bills can be exchanged at the bar on level 35. 1 KM. Mr. Fox's Secret Study places players in the role of secret agents in learning, who, as a final assignment of their training, need to escape from Mr. Fox's office by solving a series of riddles. The Bank Job tasks players in the role of thieves with stealing valuable diamonds from the safe of a bank with a crooked director. The power to the bank has been cut for an hour, and the game will take place in the dark with the aid of a flashlight. 43.9485418.448683 Skakavac Waterfall (Vodopad Skakavac). Waterfall located 12 km north of Sarajevo, above the Nahorevo Village. With its 98 m in height, it is the second tallest waterfall in Europe, after the Vinnufossen waterfall in Sunndal, Norway. Located in an area of exceptional natural beauty, surrounded by lush forests of spruce, beech, and fir forests, the waterfall is worth a day trip is weather allows it. A wooden pedestrian bridge takes visitors under the waterfall. 43.87388918.4086114 Olympic Stadium (Željezničar Football Club), Olimpijski stadion Asim Ferhatović - Hase (Sarajevo Football Club). Although the football quality is low, it is interesting to follow a match in a stadium which hosted the opening ceremony of 1984 Sarajevo Winter Olympic Games peacefully just a few years before war broke out. 43.8604918.44947 Dariva Canyon, Dariva (west of Goat's Bridge). 24/7. An 8 km long promenade from the historic center of Sarajevo to the Goat's Bridge, following the canyon of the Miljacka. The promenade is very picturesque, and the pedestrian-only route offers magnificent natural views which have been appreciated since the Austro-Hungarians built a railroad through the Miljacka valley. There are 150 linden trees lining the promenade, planted by diplomats residing in Sarajevo at the invitation of the mayor. Some of the trees still have plaques bearing the names of those who planted them. Free. The idyllic park of the Bosna Spring on a summer day. 43.818518.2699728 Spring of the Bosna River (Vrelo Bosne), Ilidža (25-minute drive west of Old Town, 3 km beyond the suburb of Ilidža), ☎ +387 33 580-999. 08:00-23:00. The beginning of the river Bosna, where the pure and ice cold water surges out of the mountains. Here you can walk in large, well-kept park, picnic, and spend the whole day without getting bored. May 1 festival is held here. 2 KM park admission, 2 KM/hour parking, 30 KM for a horse-and-carriage ride. Antilopes in the Sarajevo Zoo. 43.878262818.41217899 Sarajevo Zoo (Pionirska dolina), Patriotske lige 58, ☎ +387 33 560 560, fax: +387 33 560 561, e-mail: info@park.ba. 08:00-21:15. A small zoo and recreation park at the outskirts of Sarajevo, primarily aimed at children. It is the oldest zoo in Bosnia and Herzegovina, during the Austro-Hungarian period located in Ilidza but later moved to its current location. There are 57 species of animals from all over the world on display, including lions which have been donated by the zoo of Sofia in 2013. A little train and several other attractions and playgrounds are available for the entertainment of kids, some at an extra fee. 3 KM for adults, 2 KM for kids. 43.841826818.414856510 Sunnyland, Miljevići bb (take bus 59a from Latinska ćuprija terminal to Hambina carina, then walk up the hill), ☎ +387 57 991 339, e-mail: info@sunnyland.ba. 09:00 - 22:00. A newly constructed bobsleigh track on Mt. Trebevic overlooking Sarajevo, and adjacent restaurants and bars selling mediocre food and drinks. Excellent entertainment for kids, with indoor playgrounds and facilities, but not very interesting to adults. 5 KM. 43.8548718.4140411 Sarajevo Film Festival, Branilaca Sarajeva 24 (Bosanski Kulturni Centar), ☎ +387 33 221 516, fax: +387 33 263 381, e-mail: info@sff.ba. Annually in July or August. One of the best film festivals in Europe and the largest of its kind in Southeastern Europe. 43.858501818.420932712 MESS: International Theater Festival (Internacionalni Teatarski Festival), Maršala Tita 54, ☎ + 387 33 200 392, fax: + 387 33 211 972, e-mail: info@mess.ba. Annually in October. Festival for expressive arts, with special attention to youth and alternative subjects. Held in Kamerni teatar. 43.857101518.416264413 Sarajevo Jazz Festival, La Benevolencija 14, ☎ +387 33 550 480, fax: + 387 33 550 481, e-mail: info@jazzfest.ba. First week of November. A very eclectic festival, and the largest of its kind in the Balkans. 43.859029818.413010814 Sarajevo Winter International Festival (Sarajevska zima), Maršala Tita 9a/V, ☎ + 387 33 266 620, fax: + 387 33 266 621, e-mail: ibrahim.spahic1@gmail.com. February - March annually. Winter counterpart of the Film Festival, with room for music, visual arts, film and video, performing arts and literature. A special program for children is available. 43.858211718.422487115 Nights of Baščaršija (Baščaršijske noći), Cemalusa 1/2, ☎ + 387 33 207 921, fax: + 387 33 207 972, e-mail: koncagsa@bih.net.ba. During July the old part of the Sarajevo city becomes a place of various activities: theatre performances, classic and rock music concerts and folklore dances. 43.858943718.433497516 Sarajevo International Guitar Festival, Vijećnica, Obala Kulina bana, e-mail: office@sigf.ba. Annually in April. International Guitar Festival gathers some of the most eminent guitar players, who present their artistic and educational programs through concerts, workshops and competitions. €30-€75. 43.7158218.287317 [dead link] Bjelašnica. 09:00 - 16:00. Ski resort about 35 km (1 hour drive) away from Sarajevo, with 14 km slopes in all difficulty levels. A day pass costs 25 KM for children and 35 KM for adults. Night skiing is also possible in season, for an additional 18 KM. Snow landscape of the Jahorina ski resort in winter. 43.736518.566718 [dead link] Jahorina. Roughly as far away from Sarajevo as Bjelašnica, the ski resort of Jahorina is on the border of the Federation of Bosnia and Herzegovina and Republika Srpska, the town itself on the Republika Srpska side of the mountain. The resort offers 25 km of slopes in all difficulty levels and 11 lifts, and gained fame as the location for the Women's Alpine competitions in the 1984 Olympic Games. A day ticket costs 29 KM for children and 39 KM for adults. From May to August, when temperatures in Sarajevo peak, there is no better way to cool down than the crystal clear 12°C cool water of the Neretva. The Neretva is a white water river in Herzegovina, and one of the most popular destinations for rafting. It offers exciting rapids, canyons, clean and fresh drinkable water, untouched nature, great beaches, fish, birds, and a lot of adrenaline of course. There are several possibilities for rafting excursions from Sarajevo, including shuttle transfer to/from the starting point in Konjic. Don't forget to inquire about combining a rafting excursion with a visit to Tito's bunker along the Neretva, Bosnia's largest Cold War era facility recently opened to visitors. Descent of the white waters of the Neretva river in a raft. When temperatures rise in the city, the aqua park of Ilidza may offer refreshment. 43.857151818.430093323 Isa-begov Hamam, Bistrik 1 (Next to Emperor's Mosque, across the Latin Bridge), ☎ +387 33 570-050, e-mail: info@isabegovhotel.com. M-F 10:00-13:30 for men, 14:00-18:00 for women, Sa 09:00-19:00 for women, Su 09:00-19:00 for men. Renovated hamam in the Isa-begov Hotel with traditional ottoman steam room, water pool and massage facilities. 20 KM. Fruits, vegetables, and of course also walnuts for sale at the Markale market. It is possible to pay with credit cards in most shopping centers and in nearly all better restaurants. This is not the case, however, in most cafés, clubs and shops that sell handicrafts and souvenirs in the old part of the city, where even the "too large" notes might not get easily accepted (so it's handy to have the smallest notes (10s and 20s) stashed, too). 43.8590118.423321 Markale Market (Gradska Tržnica) (it is a big yellow building; the main entrance is on Ferhadija and backs onto Mula Mustafe Baseskije where there is a plaque on the wall with victims' names on it). 07:00­–17:00. The City Market Place Markthalle was designed by August Butsch in 1894 in the Neo-Renaissance style and was opened in 1895. Marked the start of NATO intervention and thereby end of the war after a bombing, which took the life of some 40 people. Markale was bombed two times: first in Feb 1994 (which is important in terms of casualties) and second in August 1995 (which initiated NATO military intervention, and with it, the beginning of the end of the war). Today the market is repaired and home to local meat, cheese, and vegetable merchants. Free. Baščaršija has plenty of carpets and local copperware on sale. Over a century ago, each street in this area hawked a specific ware: for example, one street had all the coppersmiths, shoes were on another, jewelry on yet another. While in Baščaršija, don't miss the underground souk that stretches along the west side of Gazi Husrev-begova street (open 08:00–20:00). Souvenir shopping in Gazi Husrev-Bey's bezistan. 43.8587918.428042 Bedesten (Gazi-Husrev Beg's Bezistan), Gazi Husrev-begova, ☎ +387 33 532-144. M-Sa 08:00-20:00, Su 10:00-19:00. 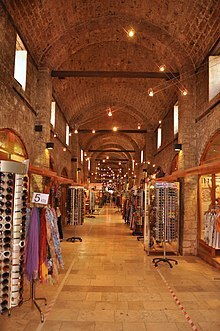 A covered market for haberdashery and craftsmanship, built during the Ottoman Empire period, with a design based on the design of the mosques. The bedesten serves as the central building in the historic commercial part of the city, and has its origins in the Greco-Roman basilica or kaiserion which served a similar purpose. During Ottoman times, the bedesten was of such economic importance that cities were classified under two categories: those with a bedesten, and those without. 43.858563718.41845844 Sahinpasic, 38d Titova. Has a solid collection of historical literature. Sarajevo offers numerous shopping malls, the most notable being the Sarajevo City Center in the commercial district. Most shopping malls in Sarajevo have been newly constructed or renovated, and offer a modern shopping experience to those who can stand the annoying pop music they play all day long. The Sarajevo City Center in the business district: shopping, food and recreation. 43.8553618.408127 Sarajevo City Center, Vrbanja 1, ☎ +387 62 992 492. 10:00-22:00. Landmark in the commercial district, and located centrally in Sarajevo along the boulevard connecting the airport with the historic center of the city. Houses the largest shopping center in the city, with 160 stores, countless restaurants and bars, and a luxury hotel. The local currency is konvertibilna marka (KM, Convertible Mark (international abbreviation BAM), which is fixed at €1 = 1.95583 KM (~1 KM = €0.51)), and is used throughout the country. Many restaurants in Sarajevo, in particular those in the tourist districts, may also accept euros at €1 = 2 KM. The somewhat weird fixed exchange rate is due to the Convertible Mark being pegged 1:1 to the erstwhile Deutsche Mark which has since been replaced with the Euro at the aforementioned exchange rate. In addition to banks, money can be exchanged at any post office or currency exchange office/booth, both of which are scattered throughout the city (one such currency exchange booth is located on the east side of the Baščaršija Square (as of Nov 2017)). The majority of exchange offices in Sarajevo work from 9:00 a.m. to 9:00 p.m., while most banks are open from 8:00 a.m. to 6:00 p.m. on weekdays and from 9:00 a.m. to 1:00 p.m. on Saturdays. It is said in Bosnia that some people eat to be able to drink, others eat to be able to live and work, but true Bosnians work and live to eat. 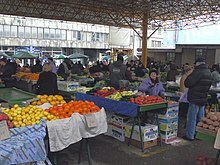 A lot of attention is devoted to the preparation and consumption of food in Sarajevo. Gastronomy in the city was developed under Eastern and Western influences, and Bosnian cuisine focuses on local produce like meat, vegetables, fruits and dairy products. For information on typical Bosnian foods, see Bosnia#Eat. Sarajevo has countless shops selling burek (meat pie, sold in layers by weight or by piece), ćevapi, and pizza. Pita (burek, sirnica, krompirusa, tikvenica, zeljanica etc.) is a filo type pasty pie generally offered in several varieties: meat (meso), cheese (sirnica, Bosnian cheese called "young cheese" similar to ricotta and never aged), cheese and spinach (zeljanica), pumpkin (tikvenica), and spicy potato (krompirusa). It is usually served with a traditional yogurt sauce that resembles sour cream. Most ćevapi places do not serve alcohol. 43.859020118.42706299 Bambus, #32, Ferhadija bb 557-190, ☎ +387 62 726 031. An amazing jewel of a restaurant in the central shopping district. You have to go down a small staircase and push a button to be buzzed in to the restaurant but once you are there you will be happy you took the time to find it. It is very classy, quiet, clean, English menu and the waiters speak English. Very good food at good prices. The food is cooked with pride and for the prices charged, it really is a good deal. 43.85294918.400259611 Cappuccino, Grbavica (near river Miljacka in green area.). Delicious Bosnian meals and the best pasta and pizza in the region. 43.858429318.43012612 Hacienda, Bazardzani 3, ☎ +387 33 441 918. 10:00-03:00. Mexican food, cocktails. Large portions with very fresh ingredients and a pleasant atmosphere. DJs are playing House and Techno Music. Comparing to some other similar places, Hacienda is more expensive but still with good atmosphere. 8-12 KM for a main course. House of Spite, with a terrace next to the Miljacka river. 43.858509618.434307613 House of Spite (Inat Kuca), Veliki Alifakovac 1 (from opposite city hall, cross the bridge and take a left), ☎ +033 477 867, toll-free: +061 338 177, e-mail: kenan.niksic@gmail.com. 11:00-23:00. The history of this restaurant dates back to the Austro-Hungarian occupation, when Sarajevo underwent large scale infrastructure projects which resulted in the post office, the National Museum, the Faculty of Law, and many others. When the City Hall was to be constructed however, the Austro-Hungarians faced the stubbornness of an old Bosnian man named Benderija who lived in a hourse in that location. He refused to have his house demolished for the construction of the City Hall, and only after long negotiations he agreed to give up his property under 2 conditions: he wanted a bag of golden coins as compensation, and the house had to be moved brick by brick to the other side of the river. Since then, the building is known as the house of spite, and a symbol of Bosnian stubbornness and resistance against the government. In 1997, the house was converted to a lovely restaurant selling hearty stew-like meals and Bosnian specialties. A terrace offers a view over the river and the Sarajevo City Hall which it replaces. The house is decorated in oriental style, and worth visiting for the ambient alone. 6-20 KM. 43.860094918.424353114 [dead link] Karuzo, Dženetića Čikma bb, ☎ +387 62 347 456, e-mail: karuzo@bih.net.ba. 12:00-15:00 and 18:00-23:00. While it doesn't serve traditional Bosnian food, this restaurant features a vegetarian/fish based menu, with a mostly Italian influence (although sushi is also available). The pasta dishes are also highly recommended. It's a very intimate restaurant seating only 18 at a time, the chef takes your order prepares the food and serves it himself. Do be aware that you probably do need to have a good deal of time to spare - it can take a couple of hours before you leave. 43.85903418.43176815 [dead link] Mrkva, Bravadžiluk 13, ☎ +387 33 532-519. 08:30-23:00. Traditional Bosnian food, a local favorite. A small chain with 5 restaurants spread out over the Sarajevo metropolitan area. 43.853545518.436367717 Park Princeva (مطعم الملوك), Iza Hrida br. 7, ☎ +387 61 222 708, toll-free: +387 33 532 403, e-mail: info@parkprinceva.ba. 08:00-23:00. Slightly more expensive than Inat Kuca, also serving Bosnian food. Located on one of the hills of the city, you have fantastic view, especially around sunset, when you can hear the prayers from the mosques around the valley. 43.858625618.429790720 Zeljo (Ćevabdžinica Željo), Kundurdžiluk 19, ☎ +387 33 441-200. 08:00-23:00. Traditional Bosnian food, a local favorite. A small chain with 4 different locations spread over the city. A good venue to visit with kids. 43.859052918.431417521 Bosnian House (Bosanska Kuca), Bravadziluk 3, Bascarsija. 24/7. Steak house. Seats inside and out in the heart of the Old Town with a wide range of traditional Bosnian food at reasonable prices. You can sit outside against the warm wall of the oven if it's chilly. Some of the waiters are fairly rude and try to persuade guests into ordering too many dishes, warning that the servings are small, which isn't the case. Muckalica, a veal broth, is delicious and good value at 10KM. 43.86102418.41792223 Moja Mala Kuhinja, Tina Ujevića 13, ☎ +387 61 144 741, e-mail: info@malakuhinja.ba. 10:00-23:00. A small restaurant owned by Bosnian celebrity Chef Muamer Kurtagic who has hosted cooking shows on national TV stations. The idea is that the whole cooking process is open for public, and customers can enjoy the cooking the food whilst also being educated. His menu changes daily according to the availability of the ingredients. Most dishes prepared by the chef are inspired by some of the best restaurant in Germany where he worked for a number of years. The restaurant can only serve around 15 guests at a time. 43.856868118.43224527 Sarajevo Brewery (Sarajevska pivara), Franjevačka 15, ☎ +387 33 491-100. 10:00-18:00. A large bar and restaurant near the Latin Bridge with lovely atmosphere and professional staff. Serves 'western' food, accompanied by a variety of beers brewed on the premises. The brewery was built in 1882 and is the only Bosnian brewery that produces dark beer. Place is more expensive than most of the places in Sarajevo. There is also a souvenir shop-museum on the premises. Sarajevo has vibrant night life with a plenty small thematic bars. Clubs are usually opened until early morning. Thursday, Friday and Saturday are hot days to hang out despite the rest of the week offers quite good night life. There are probably over 100 cafés in the city, centered in the old town, but a clear distinction is made whether the traditional Bosnian coffee is served or not. 43.858836118.42934784 Connectum/Klub Knjige, Veliki Curciluk 27, ☎ +387 33 574 700, +387 33 574 701. Part of a bookstore. 43.858565618.425630612 Central Cafe, Štrosmajerova 1, Bascarsija. Cocktail bar with great music. Get there early or call to reserve a table. The place is very busy until midnight when people leave to hit the various nightclubs around town. The street is a whole promenade with many other cafes around. If you arrive late at night, the weather is right and you have a tent with you, you can camp quite undisturbedly in the park next to the Miljacka river. Chances are that there already some more tents put up. Follow the road on the west side of town, stay close to the river and end up around. In summer there is a public toilet. This is wild camping, and there is no guard or services. It is also easy to find a room in the house of a local. 43.86448418.4229561 The Doctor's House Hostel, Pehlivanuša 67 (Straight up the hill from the Cathedral), ☎ +387 62 293 876, e-mail: doc@thedoctorshousehostel.com. Smallish hostel managed by a well-traveled American woman in a cozy house on the hillside who goes out of her way to help her guests out. Dorm beds with privacy curtain, reading light, and charging station, big lockers, well-equipped kitchen, great views from the balconies. Free WiFi. From 20 KM. 43.862102118.43906092 Haris Youth Hostel, Vratnik Mejdan 29, ☎ +387 33 23 25 63. The owner, a young chap named Haris, also owns a tourism agency right near the pigeon square at Kovaci 1 and can take you on tours around the city, annotated with his own personal experiences from the war. Although you must walk uphill for about ten minutes from the main square to get there, it is worth the walk for the beautiful view and hospitable, warm atmosphere. 43.855240918.43429273 Hostel & Guesthouse SA, Hrvatin 15, ☎ +387 61 54 89 34, +387 33 23 88 91, e-mail: sa-tourism@hotmail.com. Family-run hostel. It also provides free pick up from the train/bus/airport station. It has an awesome view of the city. From 24 KM. 43.847502118.39144055 Motel Jasmin, Kupreska 26 (in the heart of Bascarsija), ☎ +387 33 71 61 55. Singles, doubles, triples with separate bathrooms and TV. From 30 KM including breakfast. 43.86019618.4310756 Hostel Ljubičica, Mula Mustafe Bašeskije 65 (in the Old Town, next to the Bascarsija tram stop), ☎ +387 33 53 58 29. The room offered might be a dormitory located in one of several places - it might be along Mule Mustafa ulica, or else up the hill to the east of town. If you are visiting for the first time, you can make arrangements online or by phone, and also arrange with them to be picked up at the train station, or the two bus stations in the city. The owner of this hostel has a small scam going in that she charges people for a 'daily registration' of 3 KM, despite the authorities only requiring that a person be registered once when entering the country at no charge. Also, the rooms and hostel are not very clean. 23 KM/dorm. 43.860321718.4307477 Hostel Posillipo, Besarina Cikma 5 (almost directly opposite the fountain), ☎ +387 62 910546. Staff is very friendly and informative on everything from good restaurants to tales of the 1990s conflict. 30 KM. 43.858710218.42928578 Hostel/Prenociste Kod Keme, Mali Ćurčiluk 15 (in the heart of Bascarsija), ☎ +387 33 531-140. Single: 30 KM. 43.858677418.43173569 Pansion Sebilj, Bravadžiluk bb (Obala Kulina baba between Careve cuprija and Novi most at the Miljacka riverside), ☎ +387 33 573-500. Most of the staff speaks English fluently. An internet-cafe is downstairs in the same house, a restaurant in the atrium. The restaurants in the Old Town, groceries and a pharmacy are all in walking distance. Dealing with the sleeping areas only - good things: Location, friendly staff, hot water, clean. Bad things: No internet, walls are paper thin - you can hear someone cough (or scream) in the next room easily as well as the loud music from downstairs until about midnight, uncomfortable slat beds. Unisex showers (only 2) and bathroom. No way to lock bathroom or shower area when inside. No laundry service, no kitchen. No lockers for gear. 30 KM. 43.864618.43632710 Hostel Tower, Hadzisabanovica 15, ☎ +387 61 800 263, toll-free: +387 61 566 350, e-mail: tower@bih.net.ba. Dorm bed: 20-30 KM. 43.859971618.429766713 Garni Hotel Konak, Mula Mustafe Başeskije 54 (Take the number 1 tram from the train station to Pigeon Square. Follow the tram tracks west for two blocks, and it will be on your left, look for a red and white sign. ), ☎ +387 33 476 900, e-mail: info@hotel-konak.com. Built in 1962 and completely renovated in 2008. Staff are friendly, speak English, and in the off season can be persuaded to negotiate. Hotel amenities include breakfast, Ensuite bathrooms and internet connected computers, while the hostel rooms are double bed privates with satellite television which share a bathroom among three rooms. Single: €50-60; Double: €70-80. 43.861590318.422495315 Hotel Michele, Ivana Cankara 27, ☎ +387 33 560 310, +387 61 338 177, e-mail: contact@hotelmichele.ba. The staff is wonderfully nice, breakfast and laundry included and also features private parking with direct elevator access to the room floors and wireless high speed internet. 43.854219118.421432819 Pansion Čobanija, Čobanija 29, ☎ +387 33 227-001. Private bathrooms and satellite television. The rooms are clean and well-kept, and a continental breakfast is provided. €50. 43.852839218.389679625 Hotel Bristol Sarajevo (Novotel Sarajevo Bristol), Fra Filipa Lastrića 2 (15 minutes by car from airport, 5 min walk to Parliament, 5 min by car to Old Town), ☎ +387 33 705 000, e-mail: info@bristolsarajevo.com. Check-in: 14:00, check-out: 12:00. Completely renovated. Great rooms and comfortable beds. Friendly staff, three restaurants/cafés. No alcohol served, halal certified (but the pretty wide breakfast spread might contain some dubious dishes). Held in regard now as one of the best large hotels in the city. Entrance fee to a small spa is included in the room price. The easiest way to get to the old town is by taxi (which can be ordered from the reception), and the nearest tram stop is Pofalići (~300 m). Superior room from 160 KM. 43.857929118.425977526 Hotel Central, Ćumurija 8 (right across the popular Strossmayerova pedestrian street), ☎ +387 33 561 800, e-mail: info@hotelcentral.ba. One of the oldest hotels in the city historically renowned for its spa, it is now considered one of the prime boutique hotels after its recent renovation. Also the spa is excellent. Hotel Europe in the heart of Sarajevo, behind the Bezestan and Taslihan. 43.8583518.42748428 Hotel Europe, Vladislava Skarića 5 (right next to the old Turkish bazaar, Bezistan, and Tašlihan), ☎ +387 33 580 570, +387 33 580 444, e-mail: reception@hoteleurope.ba. Built in 1882 right next to medieval ruins, it was recently renovated, elevating it to five-star premier boutique status. Home to many celebrities who come to work or visit the city, such as John Travolta, Brad Pitt and Angelina Jolie. The in-house Viennese Café is great, offering many Central European as well as local specialties. The hotel offers a view over the Tašlihan archaeological site right next to it. 43.843606118.335790730 Radon Plaza, Džemala Bijedića 185 (at the bottom of Avaz tower, next to the BMW showroom), ☎ +387 33 752 900, e-mail: recepcija@radonplazahotel.ba. It is named after the last name of its owner, who is also the owner of Avaz newspaper and one of the city's wealthiest people. US$138. There are four mobile operators active in Sarajevo: BH Telecom (060, 061, 062), m:tel (065, 066, 067), HT Eronet (063) and Haloo (064). There is no 4G/LTE coverage, but 3G is widely available. Since Bosnia and Herzegovina is not part of the EU, nor the EEA, where from June 2017 new international roaming rules are enforced, the roaming rates are not capped or regulated in the country and can be much higher. Instead, Bosnia and Herzegovina is part of an own Balkan roaming zone with Montenegro, Serbia and North Macedonia where international data roaming is capped at €0.20 per MB from July 2017. It is advised to buy a local SIM card, from any of the operators, which can be purchased in one of the many kiosks around the city. BH Telecom and m:tel have special offers aimed towards tourists, starting from 20 KM for 5 GB. The local area code is +387 33 (Kanton Sarajevo) and the local postal code is 71000. There are still many minefields and unexploded ordnances in the Sarajevo area and its surrounding suburbs. Never go into damaged buildings (which are really rarely seen) and always stick to paved surfaces avoiding grassy hills that surround the city. Areas that are not cleared are marked by yellow tape or signs, but still not all minefields have been identified due to the lack of resources and the lack of international help. Paved roads are always safe. Crime against foreigners is very rare and the city is safe to visit. (As with any country in former Yugoslavia, be careful not to get into sensitive discussions about politics with people you do not know, but even those can be very educational when you come across a person who's willing to discuss it.) Be aware of pick pockets who usually operate on public transportation vehicles. Bosnia and Herzegovina has double the traffic fatality rate in Europe as a whole, and Sarajevo has recently seen a few high-profile accidents with pedestrians. Be alert whether driving or crossing the street. A final point on health and safety is that the air in Sarajevo can be noticeably thick with pollution, so that asthmatics or those with other chest problems may find themselves short of breath a lot of the time, particularly at night. Ensure you have ample medication, just in case. General emergency number, ☎ 112. Mountain Rescue, ☎ +387 33 61 29 94 43, toll-free: 121. BIHAMK (Road Assistance), ☎ 1282. 43.8567518.407535 Cantonal Police Station (Policijska stanica Centar), Augusta Brauna 5, ☎ +387 33 226 676, fax: +387 33 443 643, e-mail: ps.centar@mup.ks.gov.ba. The most significant risk to your health, land mines aside, is posed by the sun itself. Protect skin and eyes with adequate sun screen and sun glasses, which can be obtained at the apothecary. 43.8586418.4080912 General Hospital (Prim. dr. Abdulah Nakaš), Kranjčevićeva 12, ☎ +387 33 285-100, e-mail: info@obs.ba. Water from fountains and taps in Sarajevo is safe to drink, but it may have a strong and unpleasant chlorine odor depending on the season. If you're planning to travel to Sarajevo during Ramadan, consider reading Travelling during Ramadan. Cultural heritage from the Ottoman, Austro-Hungarian and most recently Yugoslav periods has been assimilated into modern Sarajevo as a multicultural, multireligious metropole. Catholic and Orthodox Christians, Muslims, and Jews share the city, and as such, common sense regarding respect towards people of these religious backgrounds should be upheld. Even the younger generation is on average very religious in comparison to other European capitals, although not all religious traditions may be followed equally strictly. For example, young Muslims may choose to drink wine, but refuse pork meat, while older Muslims likely refuse both. Keep this in mind when offering presents to your host family. When visiting mosques, skin-covering clothing should be worn, and women should wear a veil covering their hair. At the most touristic mosques, veils will be available to visitors for this purpose. Although the Bosnian War ended with a UN enforced cease fire, the underlying conflicts between the different ethnic groups in Sarajevo are far from resolved. Many inhabitants have survived the siege of the city from 1992-95, and almost everyone has lost relatives and/or friends in the conflict. Strong anti-Serb sentiments may be present among the Bosniak population, and scars from the war are left in memory. While the war is not a taboo subject, as evidenced by the many memorials and museums scattered around the city, it remains a sensitive topic that easily brings up negative memories, if addressed uncomprehendingly. Aside from anti-Serb sentiments, many also feel dismay or anger towards the United Nations, which are blamed for the Srebrenica massacre and inadequate protection of Sarajevo citizens during the Siege. There is an ongoing dispute between Bosnian unionists and Serb separatists, striving for the independence of Republika Srpska. Since some neighborhoods of Sarajevo are on the territory of Republika Srpska, opinions will vary depending on where you ask in the city. The political situation in Sarajevo in particular is complex, and outsiders taking a position may be accused of uninformed interference in internal Bosnian affairs. In general, it is advised to abstain from discussing politics, unless your conversation partner brings up the topic him/herself and asks for your opinion. The Sarajevo City Center mall features a large play area for children. BBI Centar also has one, but it's smaller. Both malls are slightly west of the downtown on the main road. 43.860318.415461 Austria Dzidzikovac 7 ☎ +387 33 279 400. fax: +387 33 668 339. e-mail: sarajewo-ob(at)bmeia.gv.at. 43.8369618.317472 Azerbaijan Džemala Bijedića 305, 71210 Ilidža, Sarajevo ☎ +387 33 695 802. fax: +387 33 695 801. e-mail: sarajevo@mission.mfa.gov.az. 43.8527918.402443 Belgium Grbavička 4 ☎ +387 33 208 362. fax: +387 33 208 362. e-mail: sarajevo@diplobel.fed.be. 43.8527718.402194 Brazil Grbavicka 4 (2nd floor) ☎ +387 33 921 802. ☎ +387 33 921 803. fax: +387 33 921 804. e-mail: brasemb.sarajevo@itamaraty.gov.br. 43.8483818.399395 Bulgaria Radnička 30 ☎ +387 33 668 191. fax: +387 33 668 189. e-mail: Embassy.Sarajevo@mfa.bg. 43.867987418.40560796 China Braće Begić 17 ☎ +387 33 215 102. ☎ +387 33 262 110. ☎ +387 33 209 918. fax: +387 33 215 105.
fax: +387 33 215 108. e-mail: chinaemb_ba@mfa.gov.cn. 43.85846618.41595597 Croatia Ulica maršala Tita 28 ☎ +387 33 277 111. fax: +387 33 472 434. e-mail: croemb.sarajevo@mvep.hr. 43.856329418.4340448 Czech Republic Franjevačka 13 ☎ +387 33 587 050. fax: +387 33 587 060. e-mail: sarajevo(at)embassy.mzv.cz. 43.852560218.41772089 Egypt Nurudina Gackića 58 ☎ +387 33 666 498. ☎ +387 33 665 659. fax: +387 33 666 499. e-mail: eg.em.sa@bih.net.ba. 43.860710518.415679610 France Mehmed bega Kapetanović Ljubušaka 18 ☎ +387 33 282 050. fax: +387 33 282 052. e-mail: sarajevo.consulaire@diplomatie.gouv.fr. 43.855316418.415958611 Germany Skenderija 3 ☎ +387 33 565 300. fax: +387 33 206 400. e-mail: info@sarajewo.diplo.de. 43.855933718.415158712 Greece Obala Maka Dizdara 1 ☎ +387 33 560 550. fax: +387 33 203 512. e-mail: gremb.sjv@mfa.gr. 43.851258518.404089813 Hungary Ulica Splitska 2 ☎ +387 33 205 302. fax: +387 33 268 930. e-mail: mission.sjj(at)mfa.gov.hu. 43.850473118.403483614 Indonesia Splitska 9 ☎ +387 33 568 510. fax: +387 33 568 528. e-mail: sarajevo.kbri@kemlu.go.id. 43.856021918.419006415 Iran Obala Maka Dizdara 6 ☎ +387 33 650 210. ☎ +387 33 225 126. fax: +387 33 663 910. e-mail: iranemb.sjj@mfa.gov.ir. 43.86259418.416417216 Italy Cekalusa 39 ☎ +387 33 218 021. ☎ +387 33 218 022. ☎ +387 33 203 959. ☎ +387 33 203 960. ☎ +387 33 203 961. ☎ +387 33 565 450. fax: +387 33 659 368. e-mail: amb.sarajevo@esteri.it. 43.856024218.430040217 Japan Bistrik 9 ☎ +387 33 277 500. fax: +387 33 209 583. e-mail: japanbih@sx.mofa.go.jp. 43.858155618.432934318 Kuwait Ulica Telirovića 1 (Talirevića 1) ☎ +387 33 569 020. fax: +387 33 207 636. e-mail: info@kuwaitembassy.ba. 43.874815818.412160619 Libya Patriotske lige 45 ☎ +387 33 226 271. ☎ +387 33 200 621. fax: +387 33 226 423. e-mail: libyanembassy.sarajevo@gmail.com. 43.849759418.401724120 North Macedonia Splitska 57 ☎ +387 33 810 760. ☎ +387 33 269 402. fax: +387 33 810 760. e-mail: sarajevo@mfa.gov.mk. 43.848879318.398980221 Malaysia Radnicka 4a ☎ +387 33 201 578. fax: +387 33 810 036. e-mail: mwsarajevo.kln@1govuc.gov.my. 43.857817118.432832422 Montenegro Derviša Numića 24 ☎ +387 33 239 925. fax: +387 33 239 928. e-mail: bosniaandherzegovina@mfa.gov.me. 43.852825218.402593223 Netherlands Grbavička 4 ☎ +387 33 562 600. fax: +387 33 223 413. e-mail: sar@minbuza.nl. 43.85909718.42622424 Norway Ferhadija 20 ☎ +387 33 254 000. fax: +387 33 666 505. e-mail: Emb.Sarajevo@mfa.no. 43.851191618.403339725 Pakistan Emerika Bluma 17 ☎ +387 33 211 836. ☎ +387 33 666 657. fax: +387 33 211 837. e-mail: parepsarajevo@mofa.gov.pk. 43.865531518.416996726 Poland Višnjik 20 ☎ +387 33 290 500. fax: +387 33 290 519. e-mail: sarajewo.amb.sekretariat@msz.gov.pl. 43.866836118.406843127 Qatar Dajanli Ibrahim-bega 23 ☎ +387 33 565 810. ☎ +387 33 565 812. ☎ +387 33 565 813. fax: +387 33 205 351. e-mail: qr.embassy@bih.net.ba. 43.855757318.420418828 Romania Čobanija 28 ☎ +387 33 207 447. fax: +387 33 668 940. e-mail: sarajevo@mae.ro. 43.850351818.409865329 Russian Federation Urijan Dedina 93-95 ☎ +387 33 668 147. ☎ +387 33 210 913. fax: +387 33 668 148. e-mail: rusembbih@bih.net.ba. 43.85551818.424842130 San Marino Mjedenica 33 ☎ +387 33 223 447. . e-mail: amb.bosniaerzegovina@gov.sm. 43.8600418.4026631 Saudi Arabia Ulica Kalemova 40 ☎ +387 33 211 861. ☎ +387 33 211 862. fax: +387 33 212 204. e-mail: baemb@mofa.gov.sa. 43.856075918.418364732 Serbia Obala Maka Dizdara 3a ☎ +387 33 260 080. ☎ +387 33 260 090. fax: +387 33 221 469. e-mail: srbamba@bih.net.ba. 43.851198518.404392933 Slovakia Trnovska 6 ☎ +387 33 716 440. fax: +387 33 716 410. e-mail: emb.sarajevo@mzv.sk. 43.855734118.4103934 Slovenia Maglajska 4 ☎ +387 33 251 770. fax: +387 33 251 773. e-mail: sloembassy.sarajevo(at)gov.si. 43.859387218.423768835 Sovereign Order of Malta Mula Mustafe Bašeskije 12/II ☎ +387 33 668 632. ☎ +49 6173 940 224. fax: +387 33 668 632. e-mail: bosniaherzegovinaembassy@orderofmalta.int. 43.856001118.435455636 Spain Ulica Mehmeda Mujezinovića 13 A ☎ +387 33 584 000. fax: +387 33 239 155. e-mail: emb.sarajevo@maec.es. 43.859092618.426172437 Sweden Ferhadija 20 ☎ +387 33 276 030. fax: +387 33 276 060. e-mail: ambassaden.sarajevo@gov.se. 43.854389918.39824838 Switzerland Zmaja od Bosne 11 (RBBH, Building B) ☎ +387 33 275 850. ☎ +387 33 254 030. fax: +387 33 570 120.
fax: +387 33 271 500. e-mail: sar.vertretung@eda.admin.ch. 43.854241518.398839839 Turkey Vilsonovo Setaliste bb (Vilsonovo šetalište bb) ☎ +387 33 568 750. ☎ +387 33 568 791. ☎ +387 33 568 792. ☎ +387 33 568 793. fax: +387 33 267 261.
fax: +387 33 568 794.
fax: +387 33 568 777. e-mail: embassy.sarajevo@mfa.gov.tr. 43.852349418.393623840 United Kingdom Hamdije Cemerlica street 39a (Hamdije Čemerlića 39a) ☎ +387 33 282 200. fax: +387 33 282 203. e-mail: britemb@bih.net.ba. 43.8572818.4002941 United States 1 Robert C. Frasure Street (Ulica Roberta C. Frasuera) ☎ +387 33 704 000. fax: +387 33 659 722. .
43.86089818.424592642 Vatican Pehlivanuša 9 ☎ +387 33 551 055. ☎ +387 33 551 056. fax: +387 33 551 057. e-mail: nunbosnia@bih.net.ba. Konjic is on the Neretva river, 43 km southwest of Sarajevo, where in 2011 the Tito bunker and Bijenale contemporary art exhibition were opened to the public. This city travel guide to Sarajevo has guide status. It has a variety of good, quality information including hotels, restaurants, attractions and travel details. Please contribute and help us make it a star!